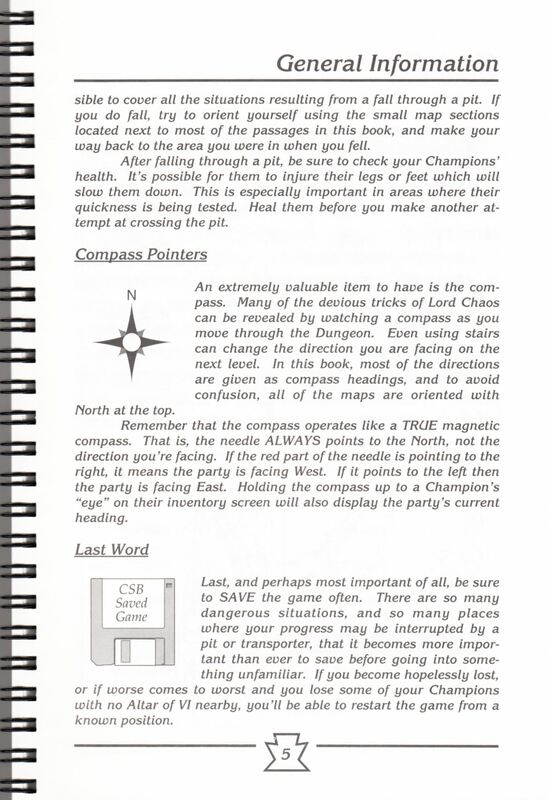 This book is Copyright © 1990 by Software Heaven, Inc. 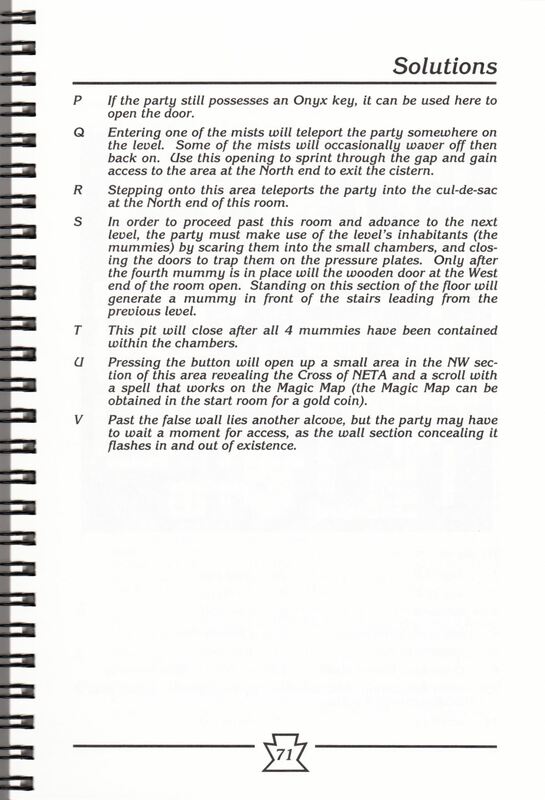 This book as a PDF Document [Supplied by 3DH]. 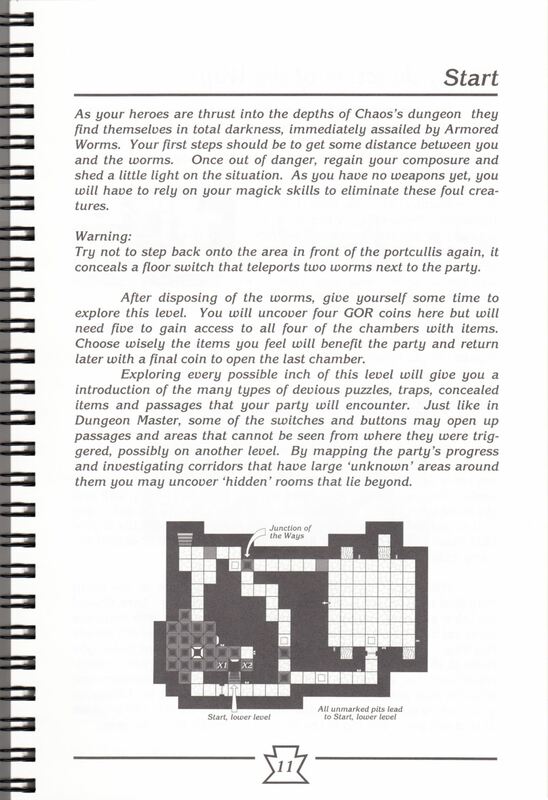 Following the release of the immensely popular Dungeon Master there seemed to be a proliferation of books on sale that would guide lost adventurers through the game. 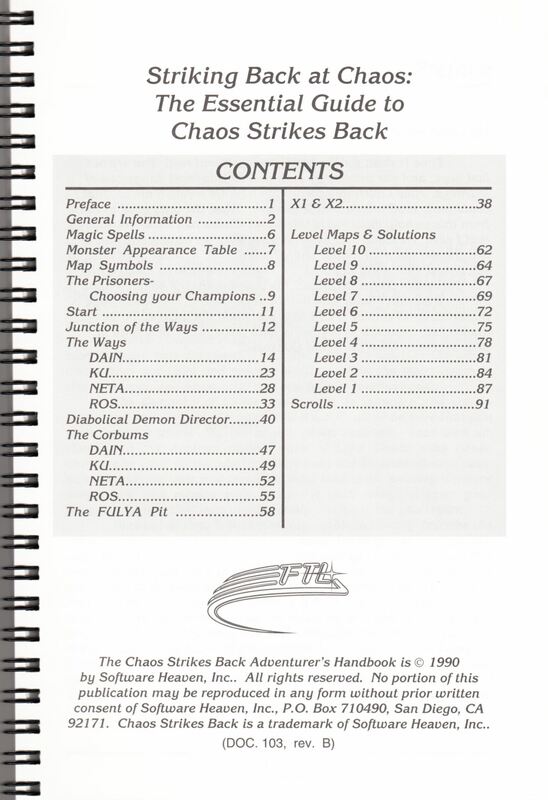 Considering how much harder Chaos is meant to be, it's surprising that there hasn't been a similar collection of books available - unless I've been looking in the wrong places. 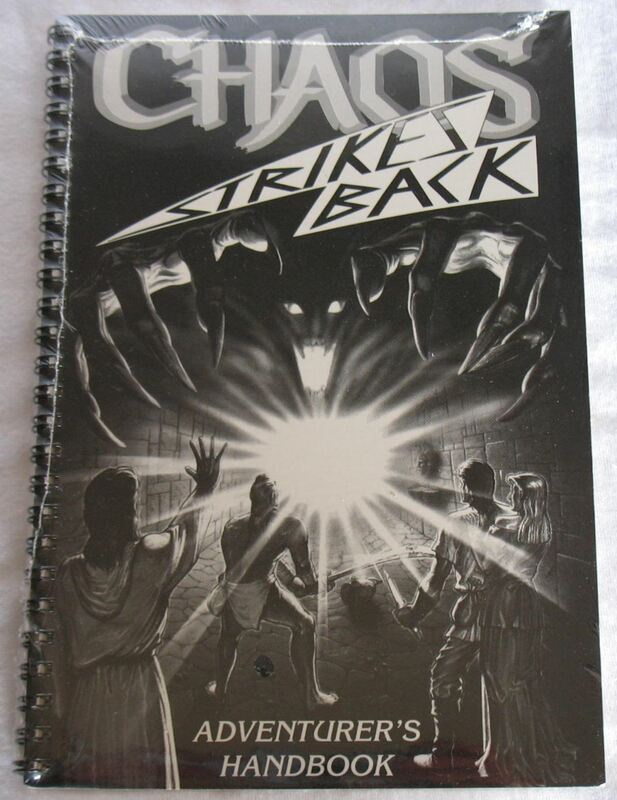 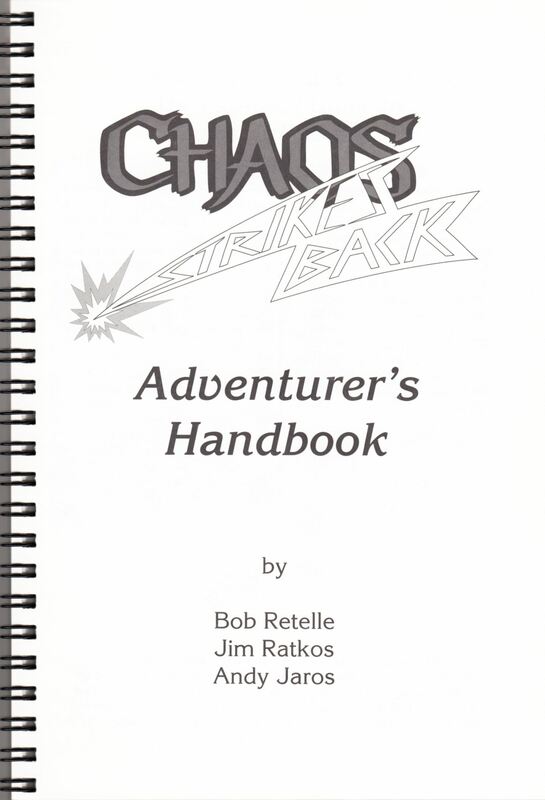 The Chaos Strikes Back Adventurer's Handbook is an A5 size, spiral bound publication of some 91 pages and it aims to provide two levels of help for lost souls, either hints or a fuller solution. 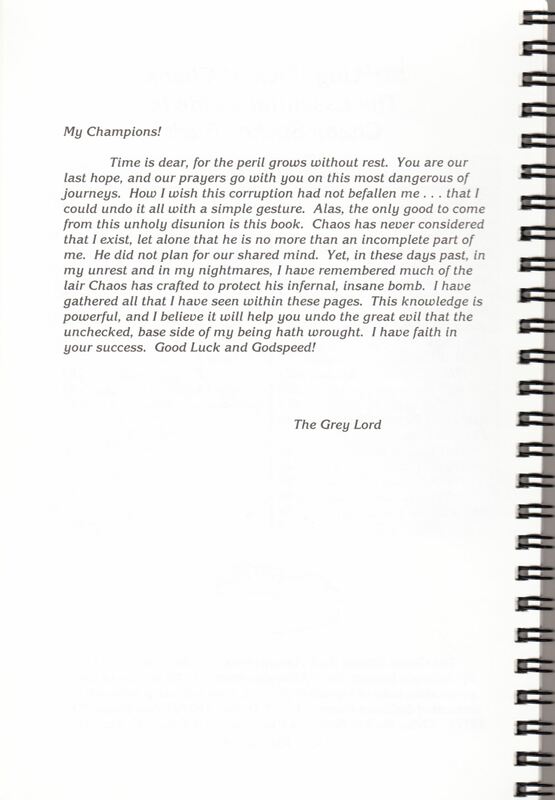 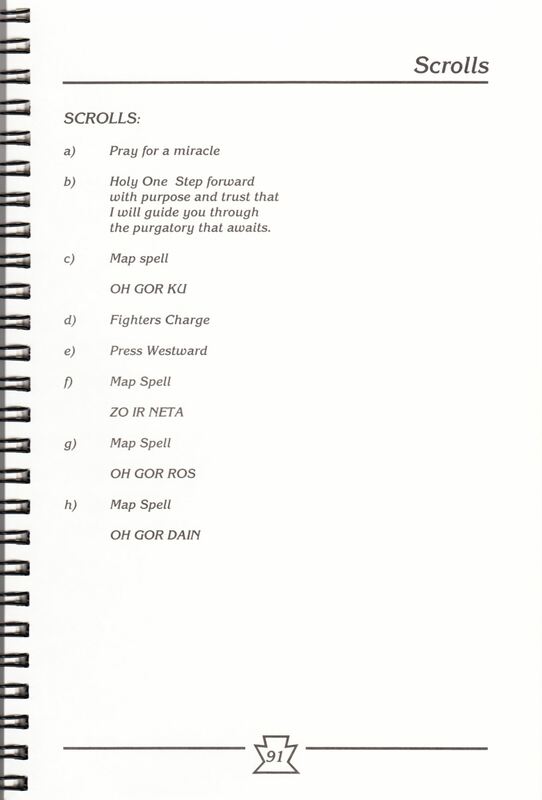 However, the first few pages of the book are given over to more general help and information, following a short message from the Grey Lord himself. 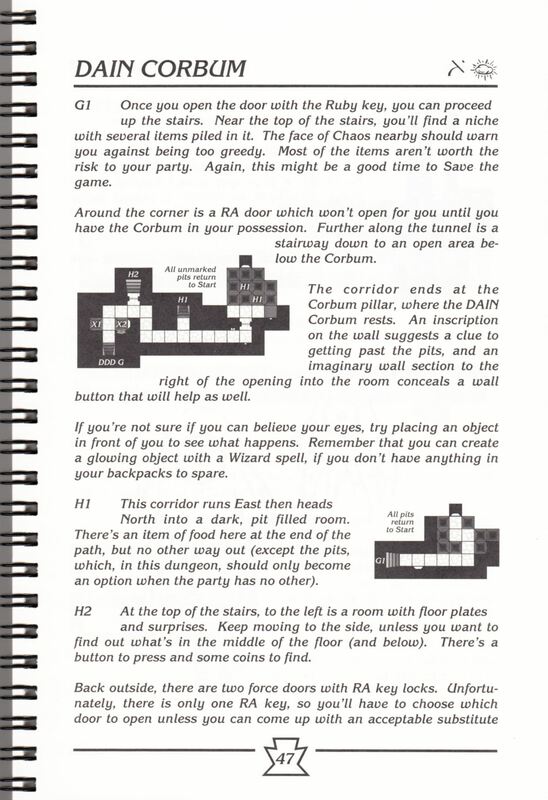 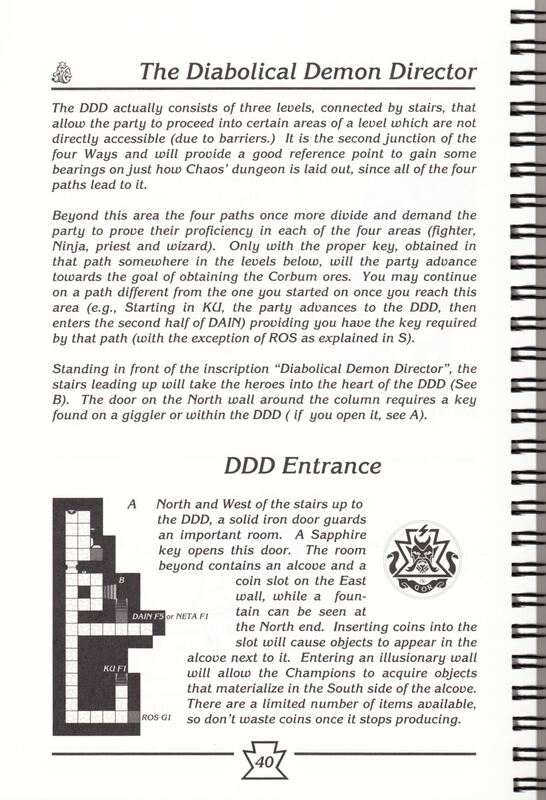 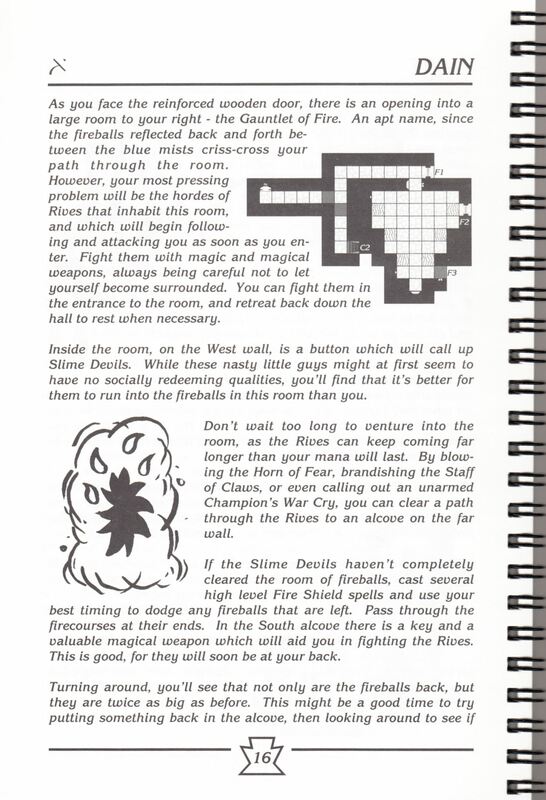 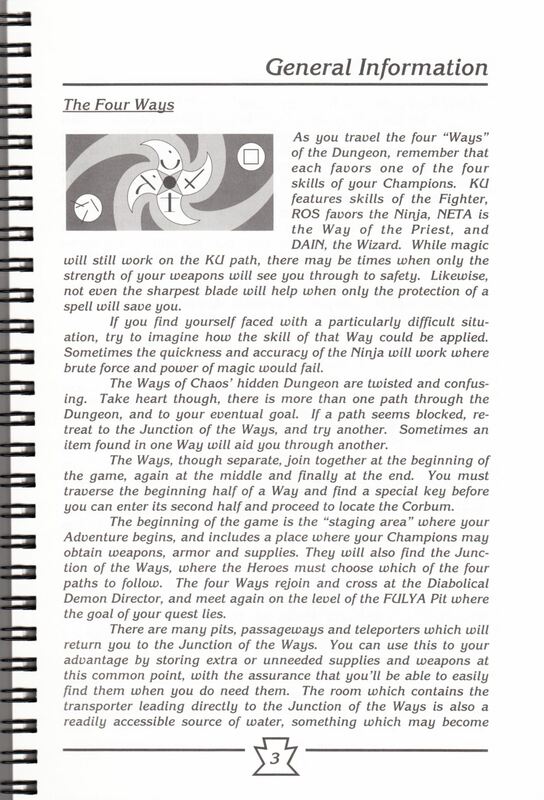 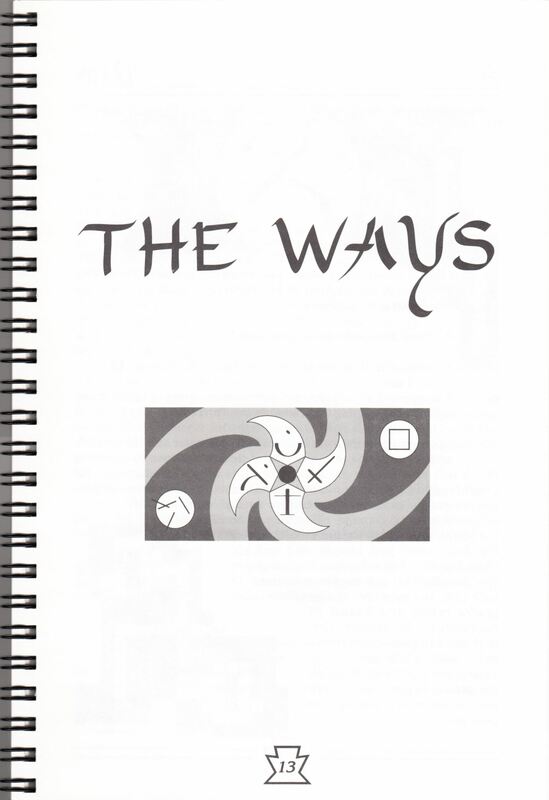 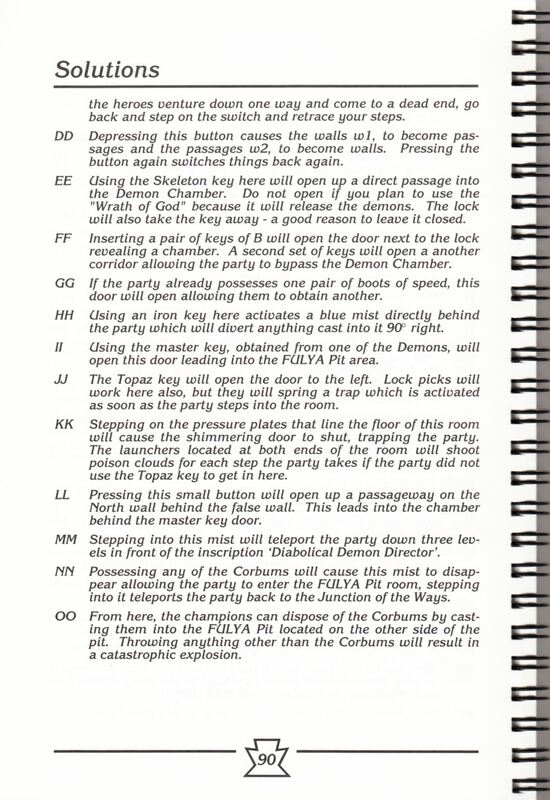 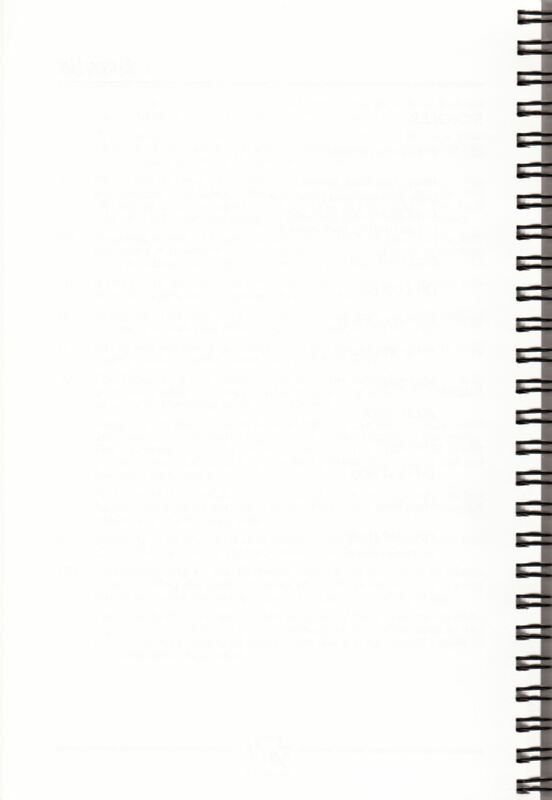 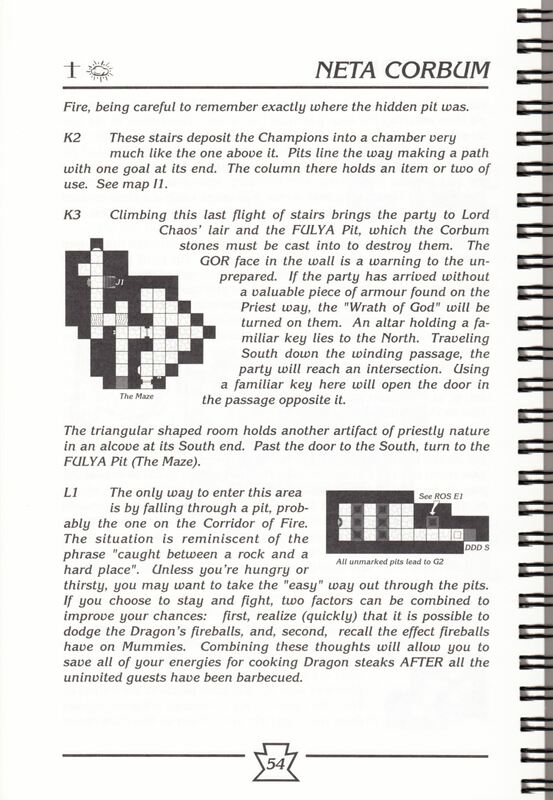 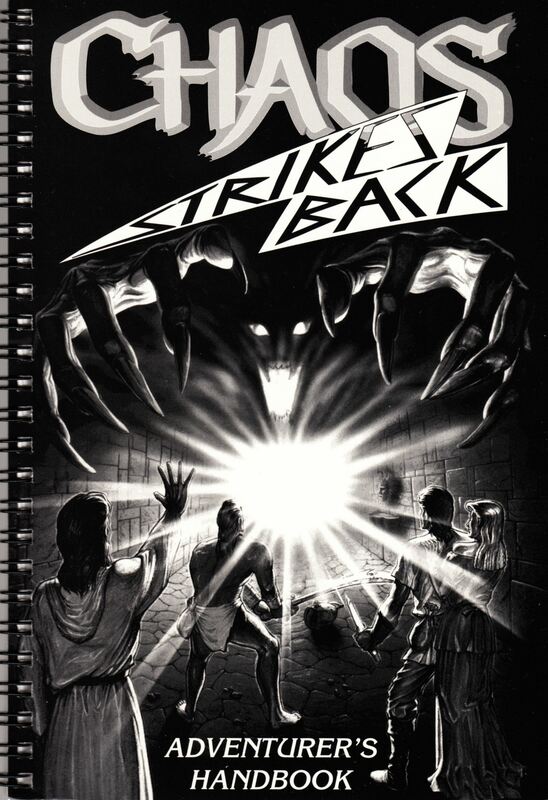 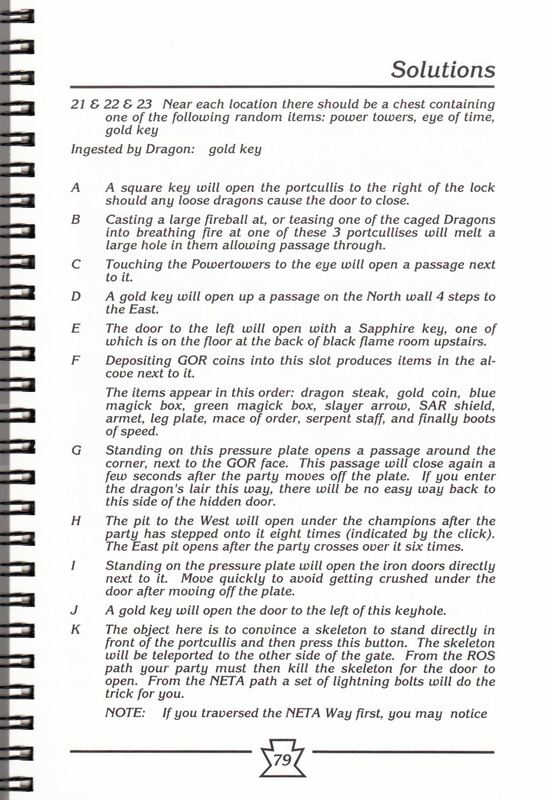 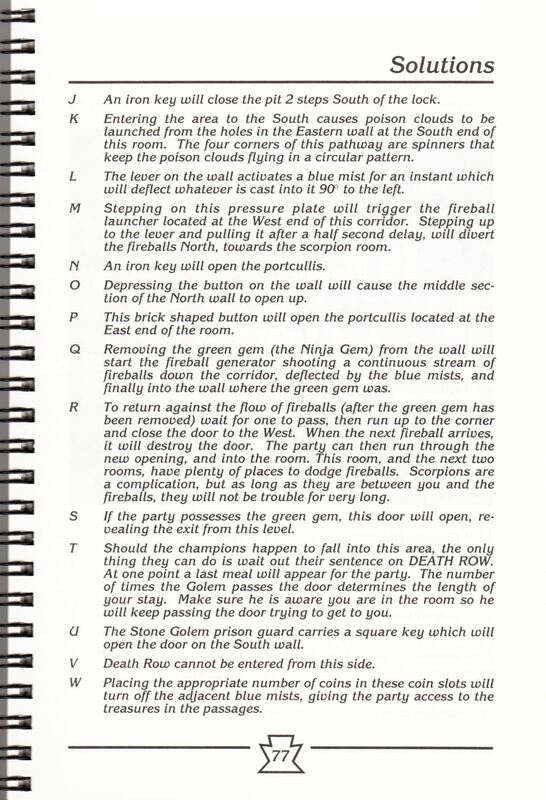 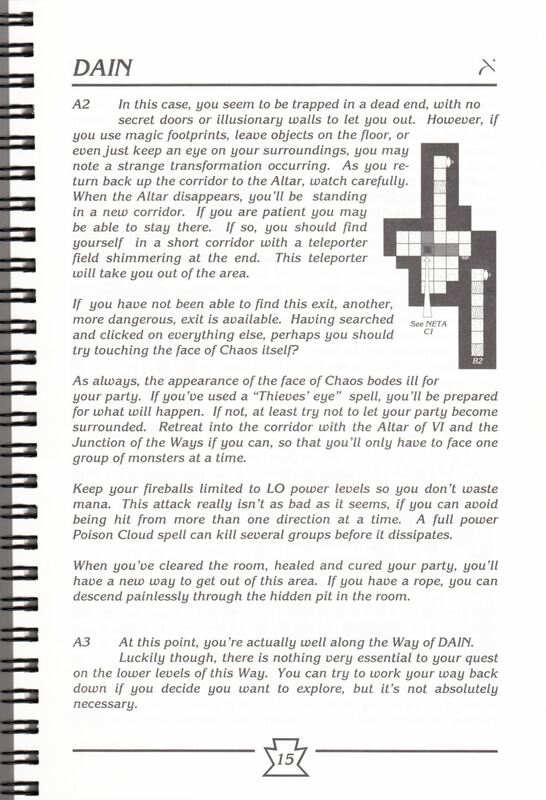 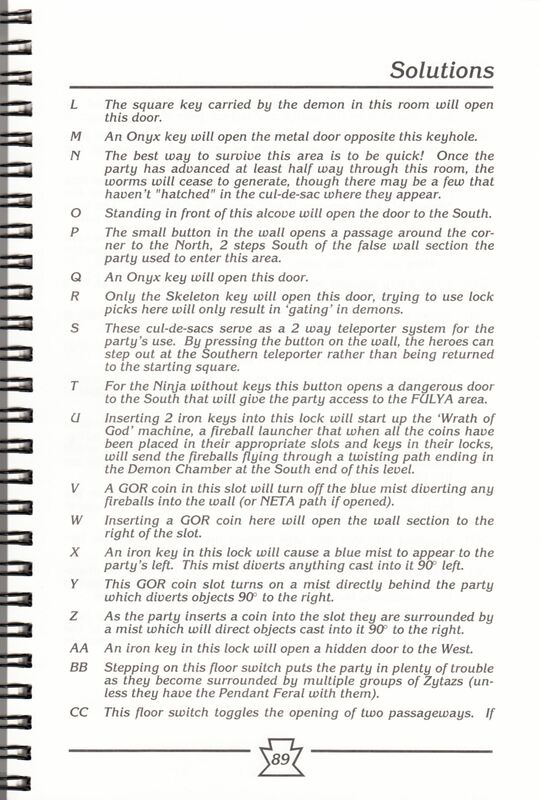 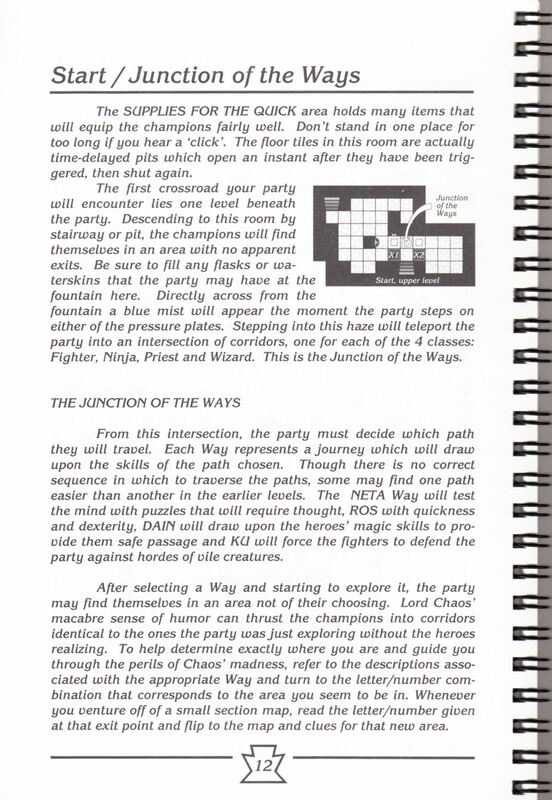 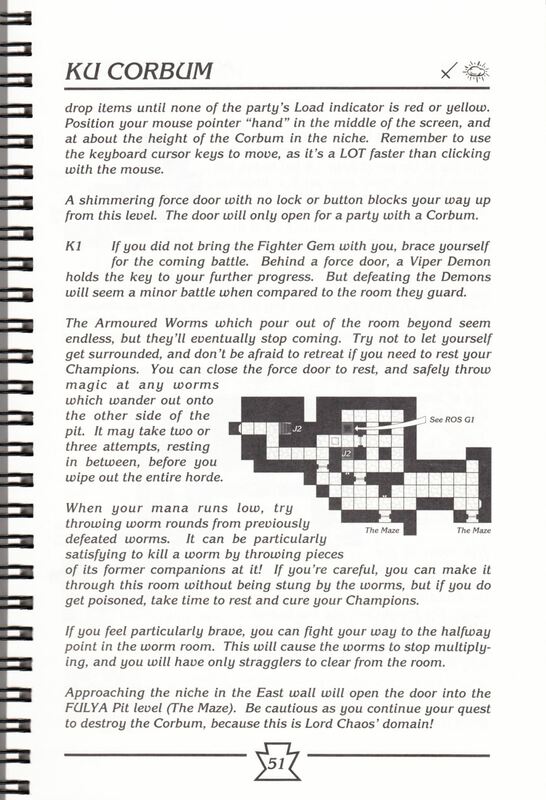 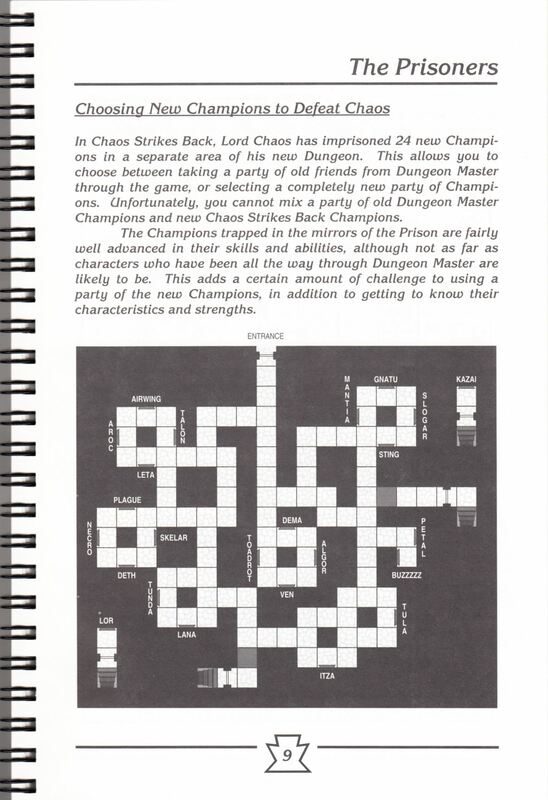 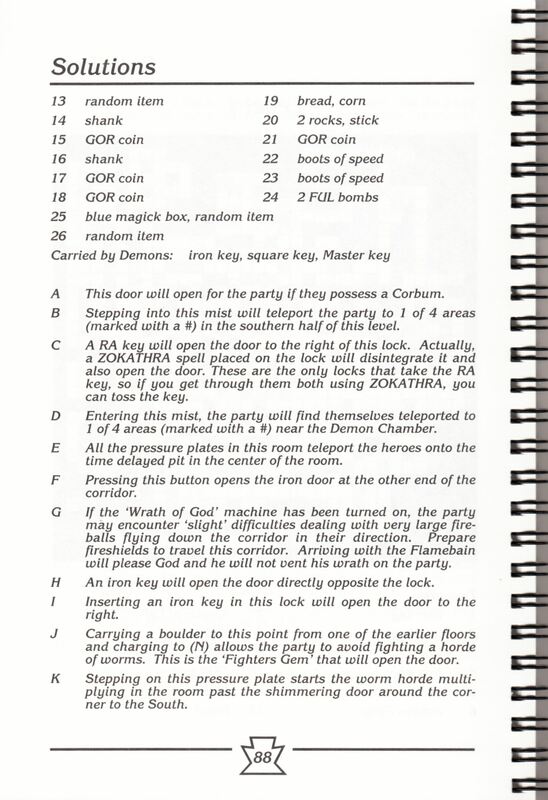 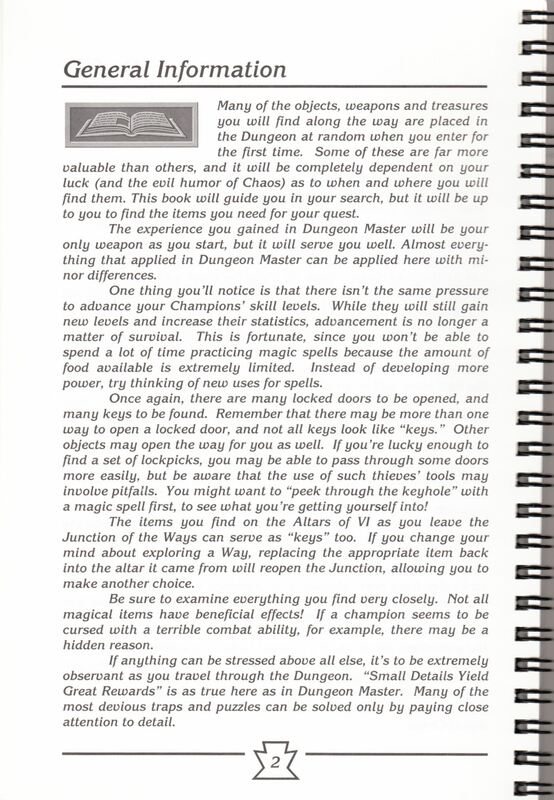 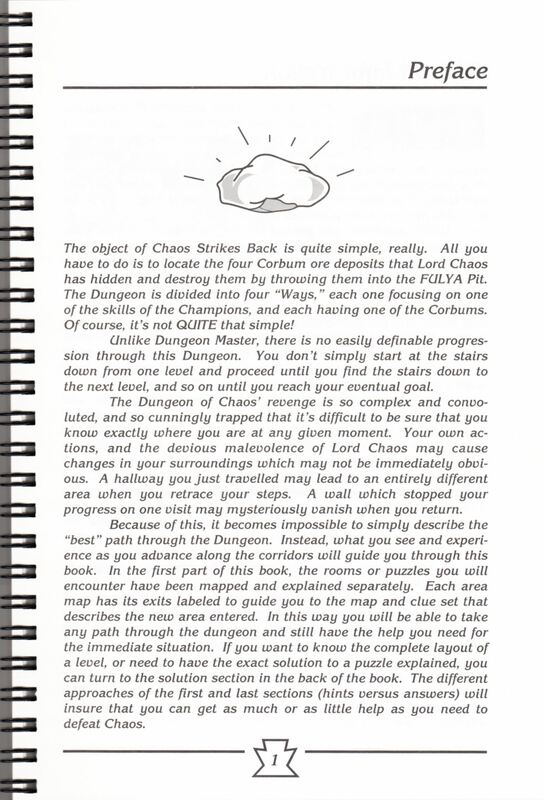 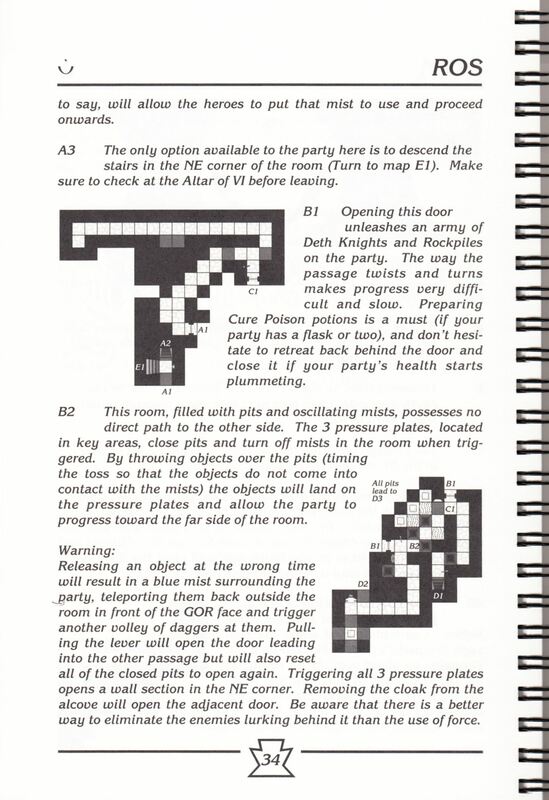 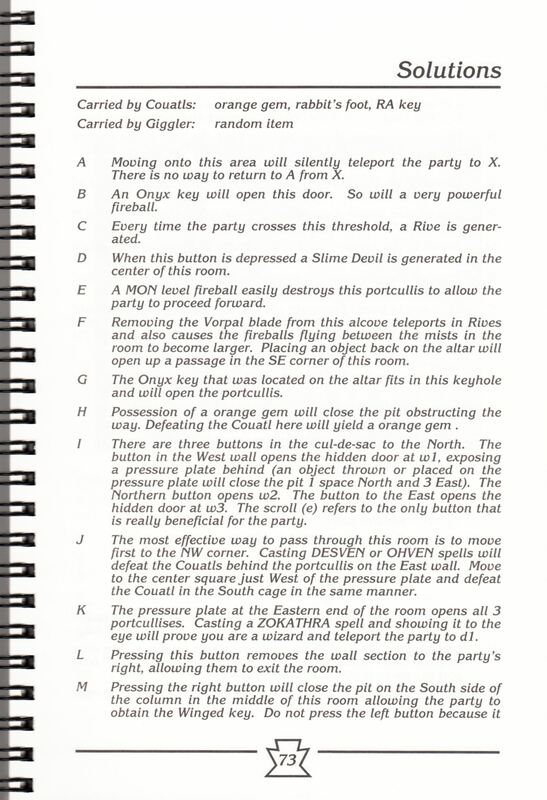 The preface details the essential aims of the game (to destroy the four pieces of corbum, thus foiling Lord Chaos' plans) and then we are told about the significance of the four Ways (one to test the skills of each type of champion - Ninja, Priest, Fighter and Wizard), the somewhat random distribution of objects in the dungeon, the sneaky nature of locked doors and their 'keys' (which may not always look like keys) and the purpose of the Junction of the Ways. 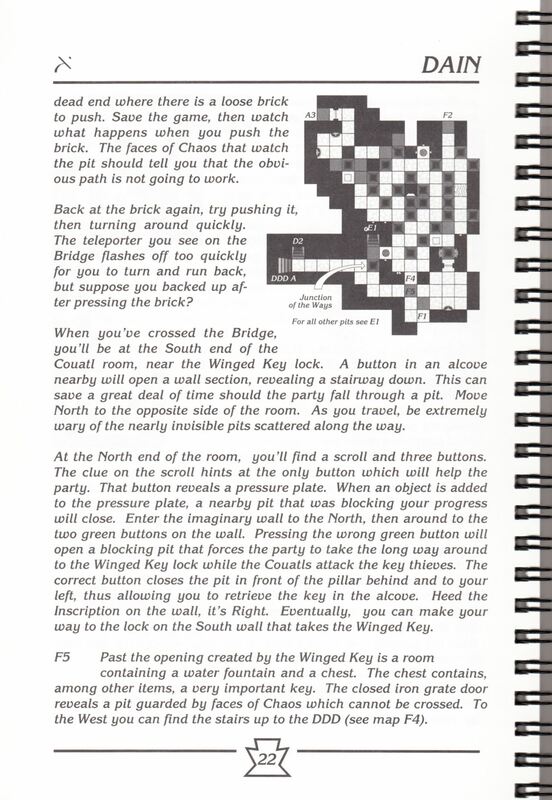 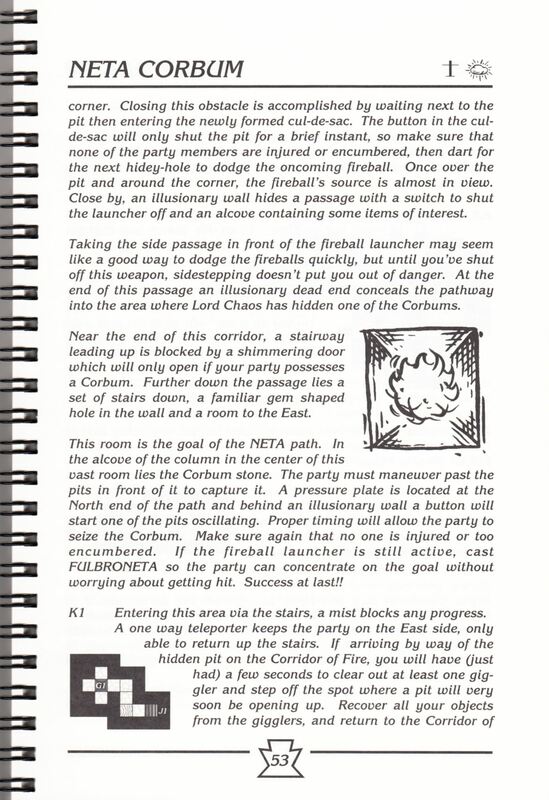 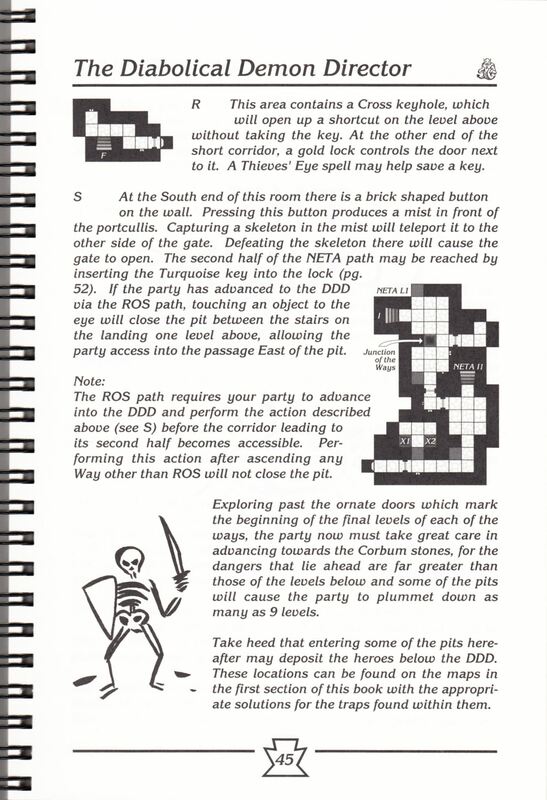 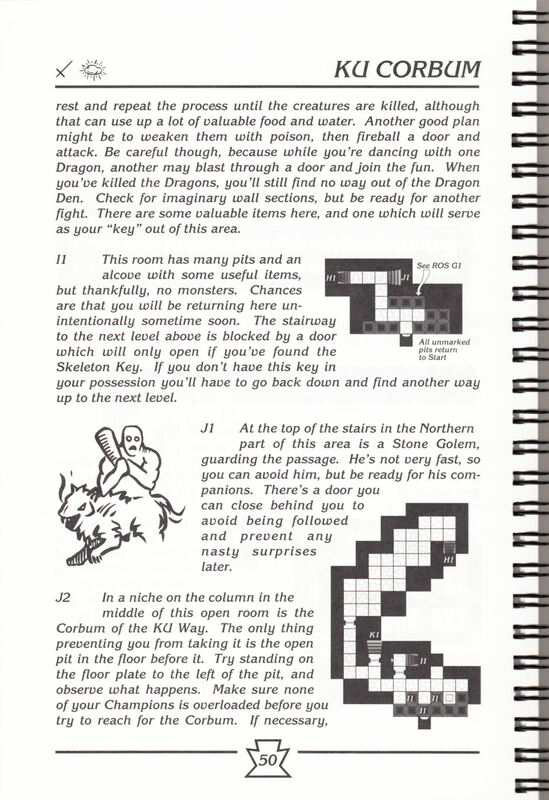 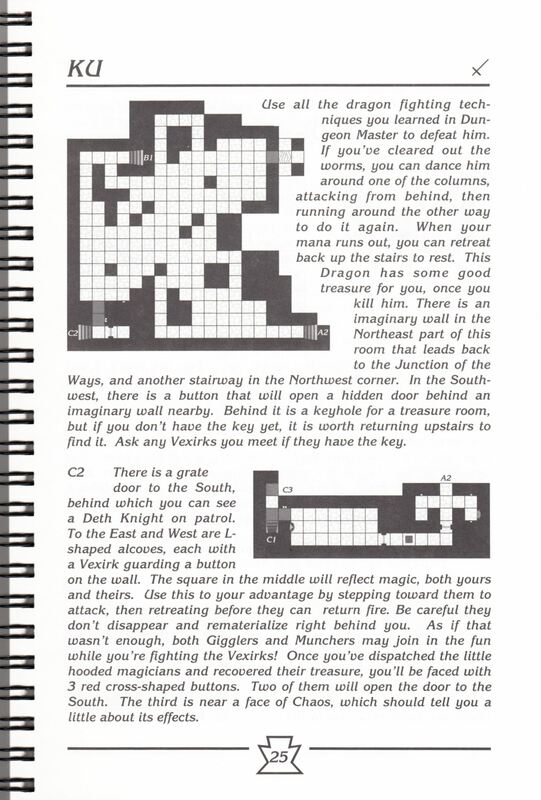 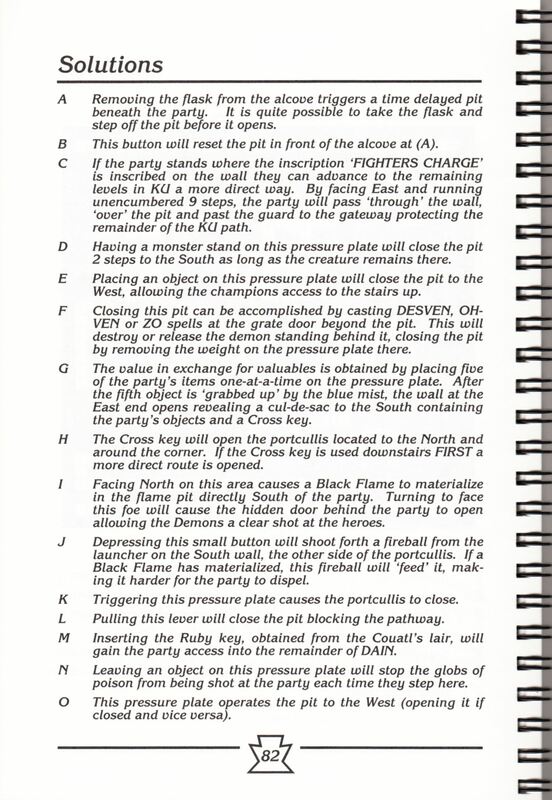 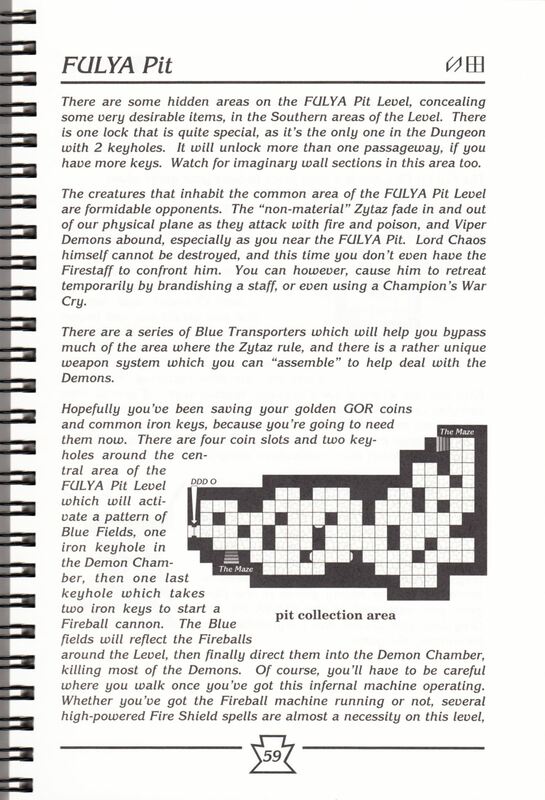 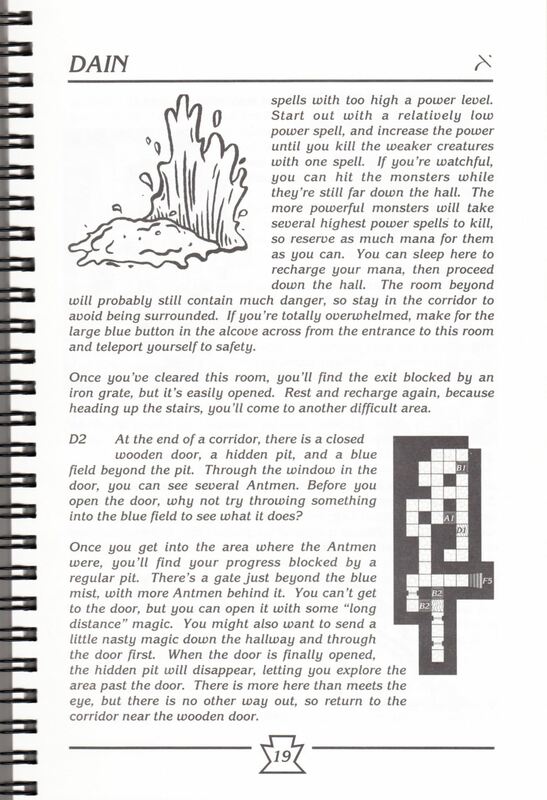 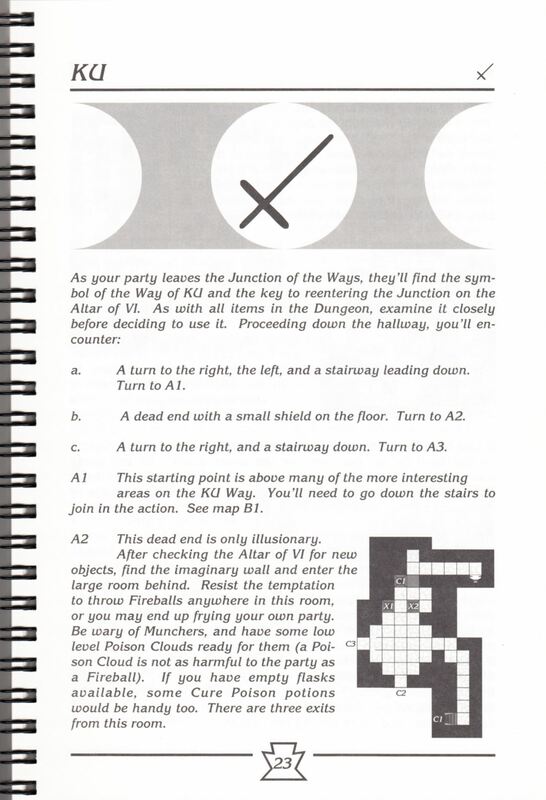 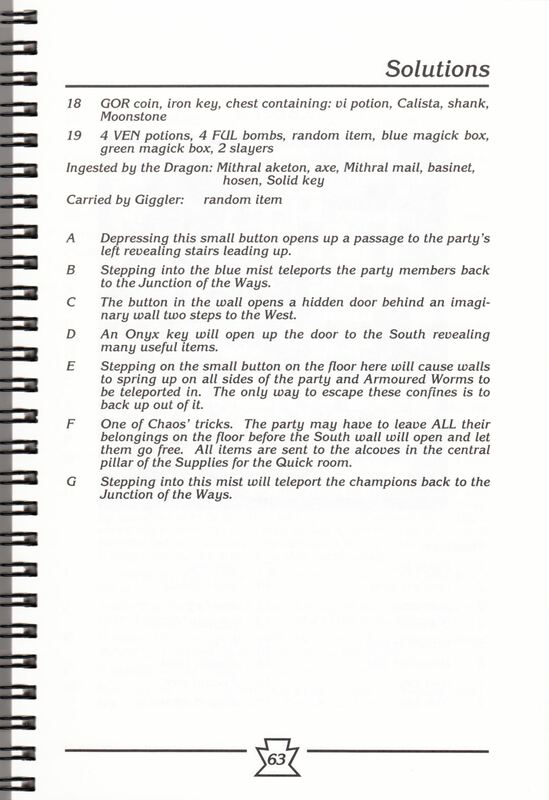 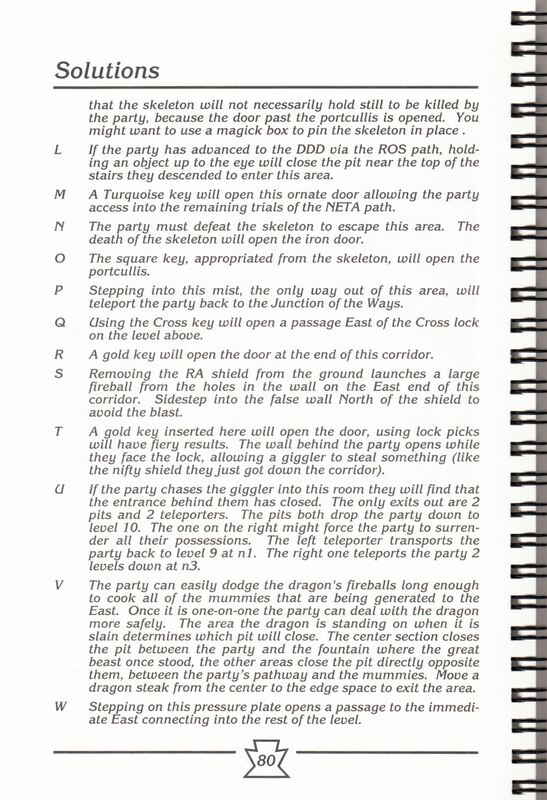 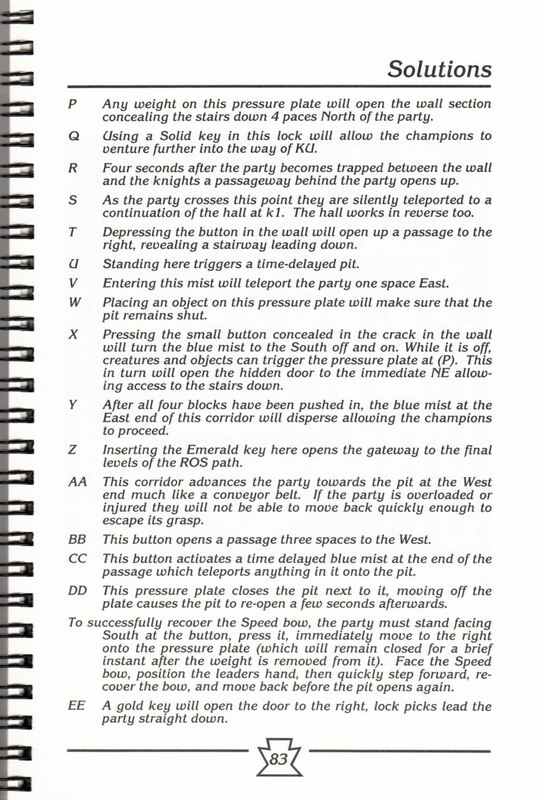 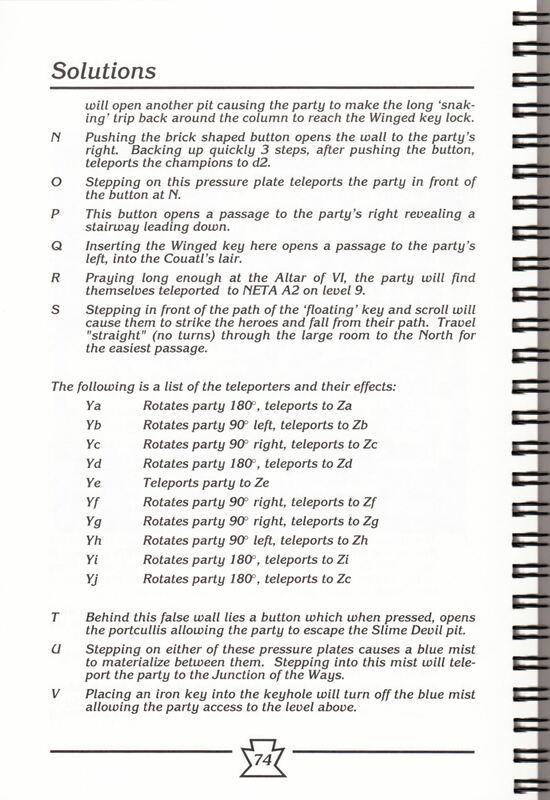 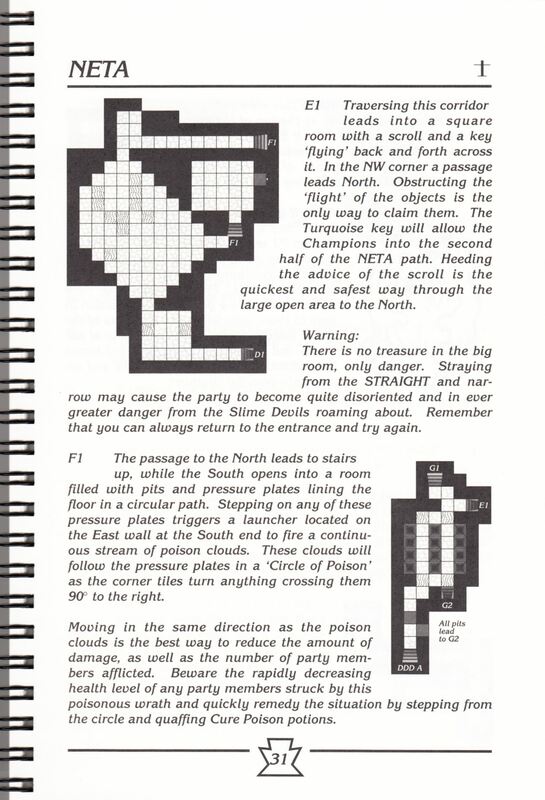 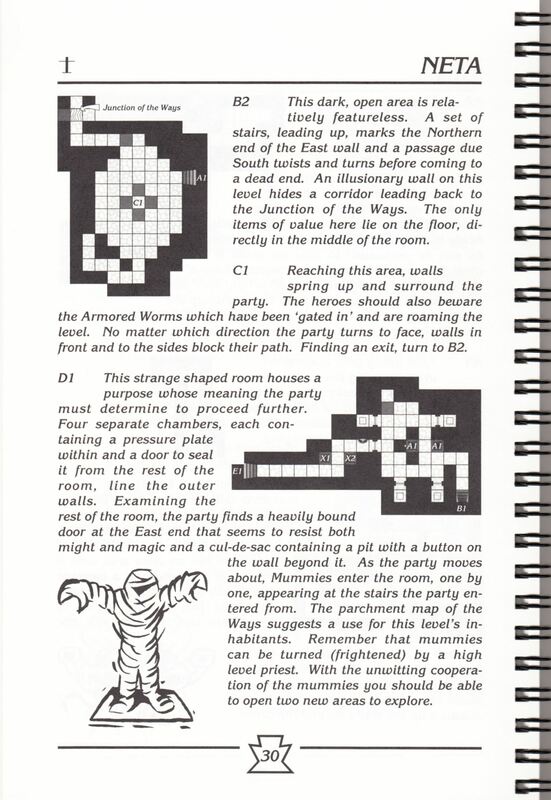 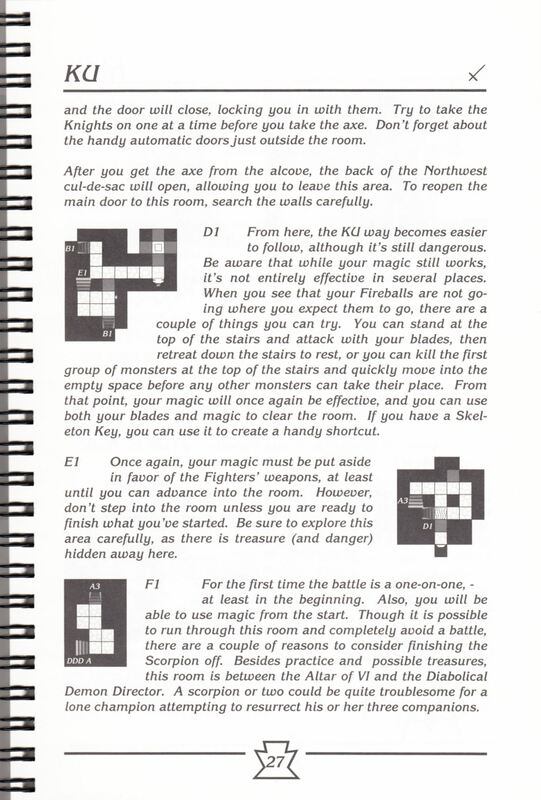 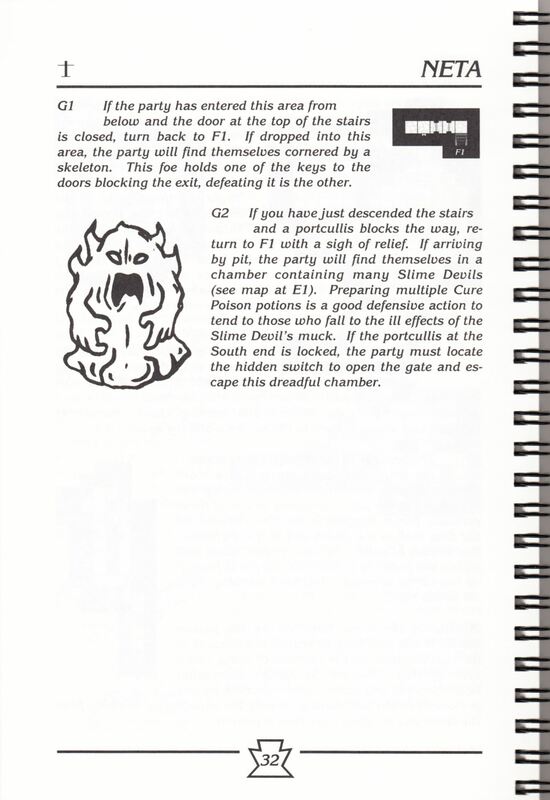 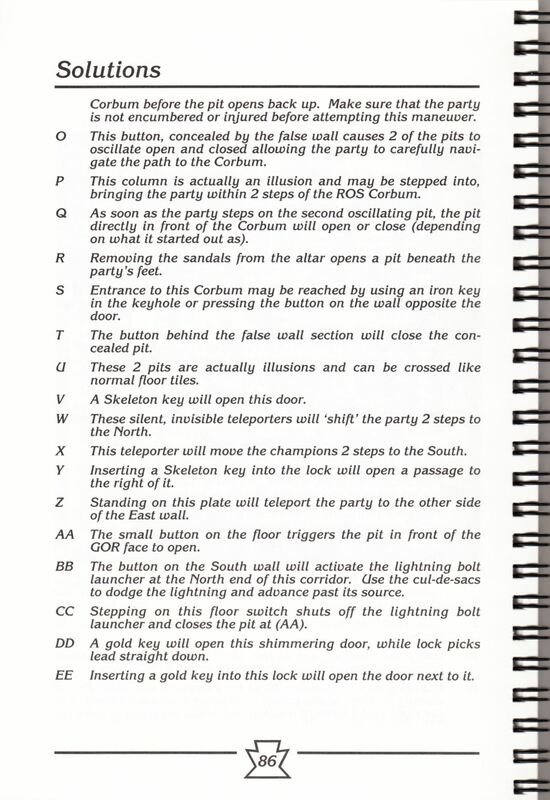 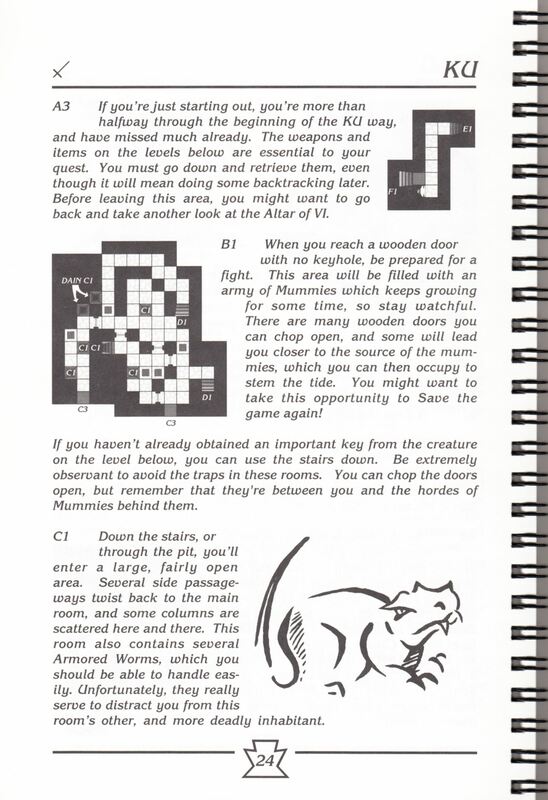 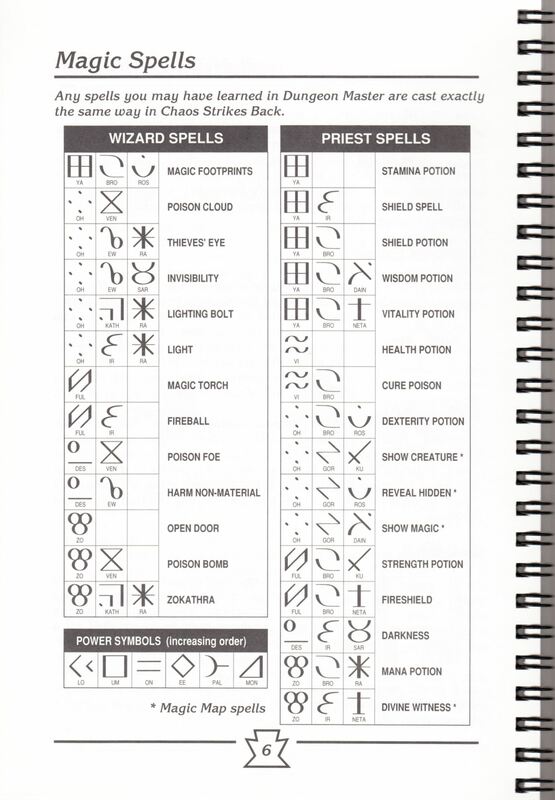 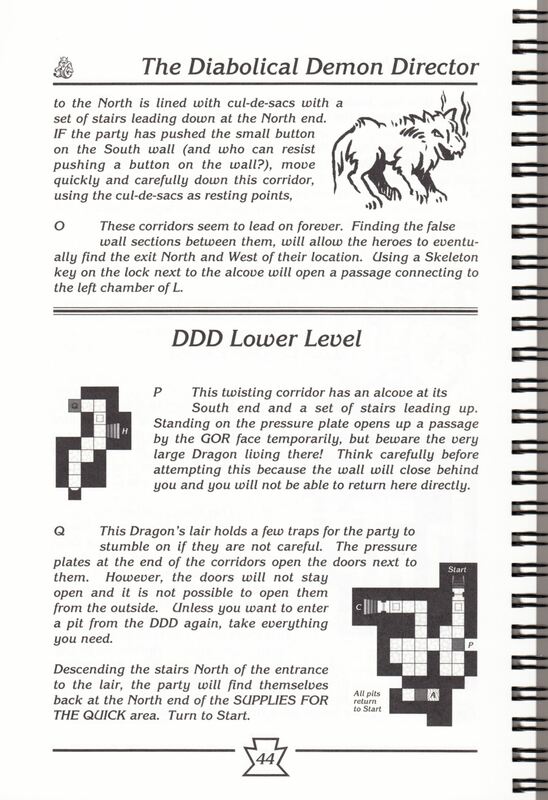 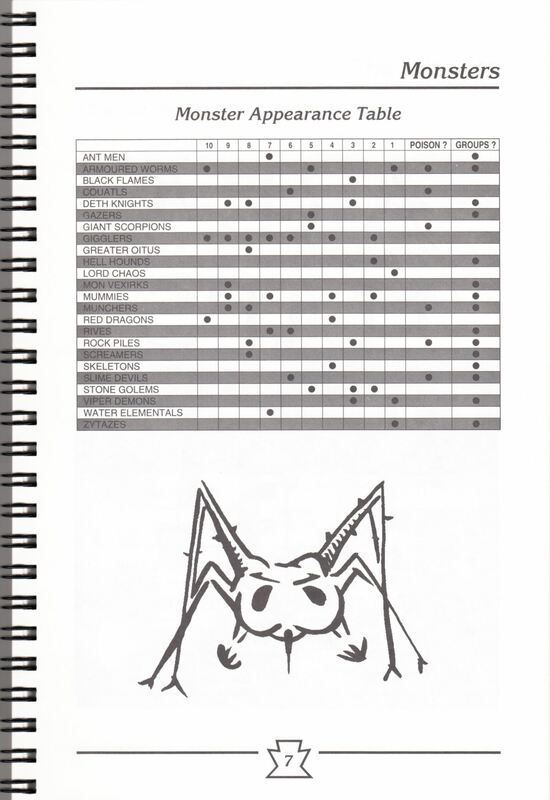 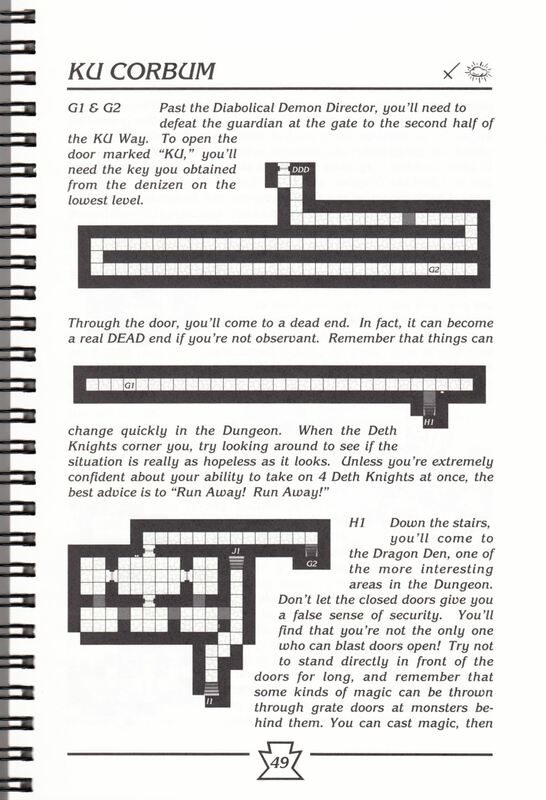 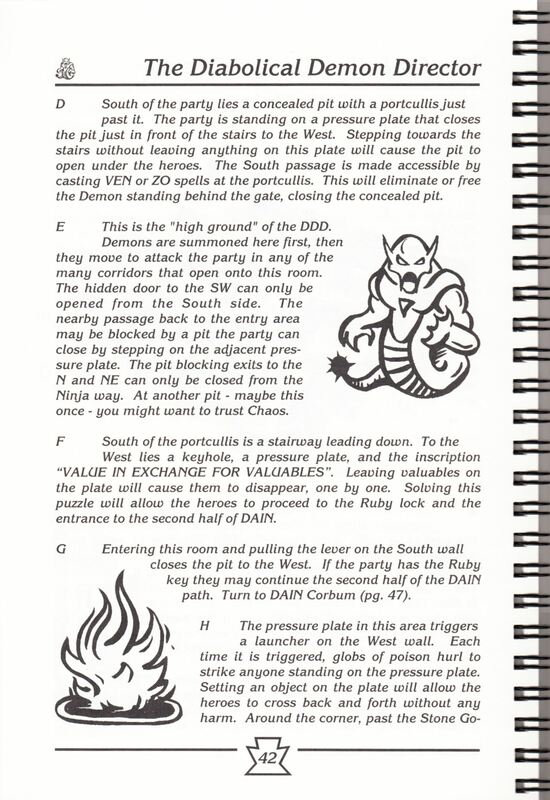 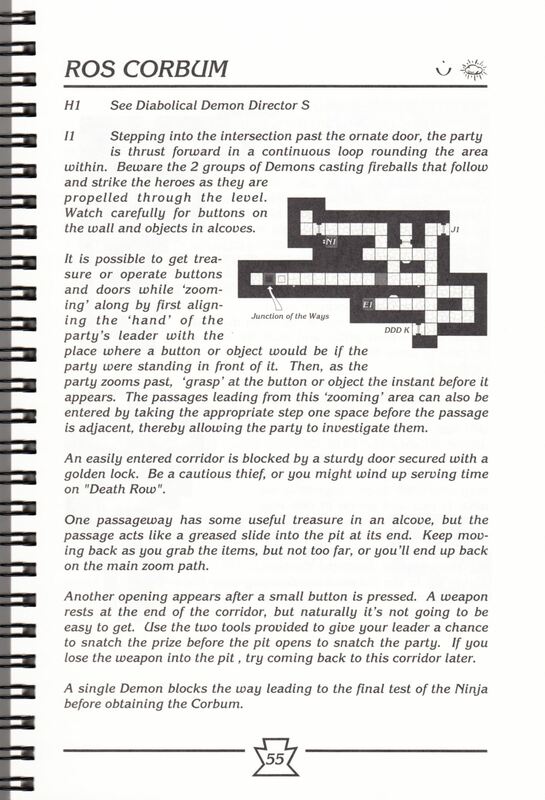 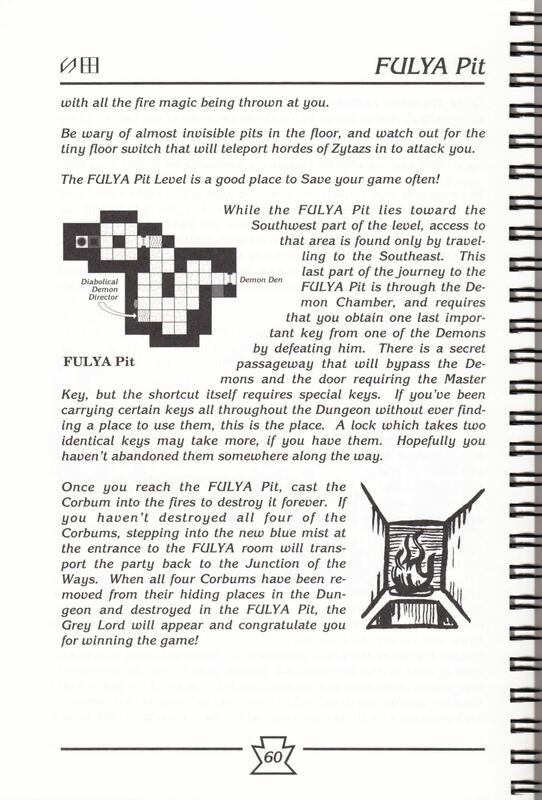 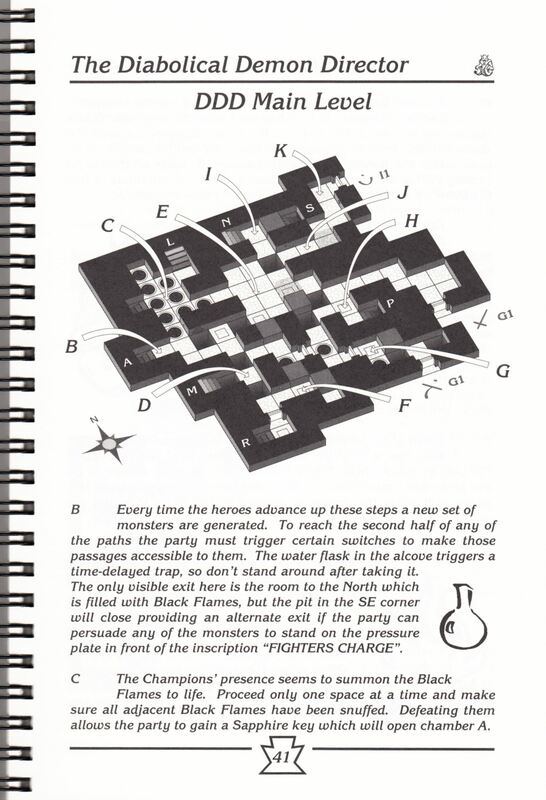 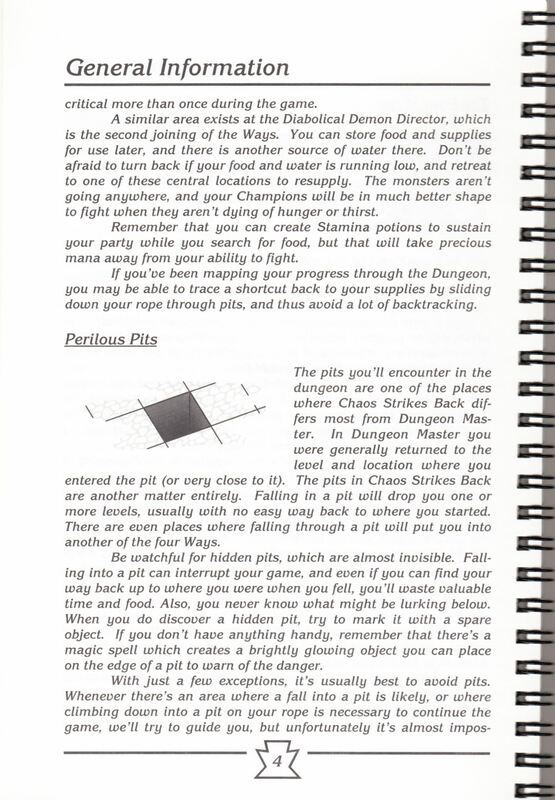 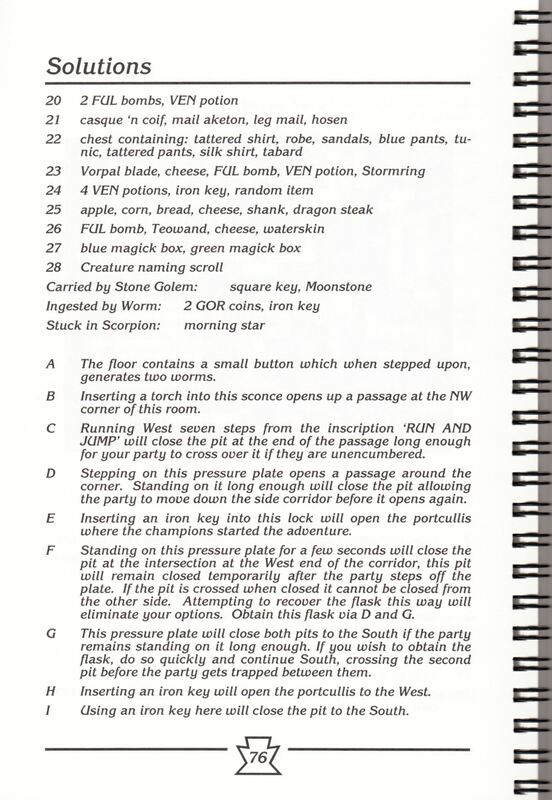 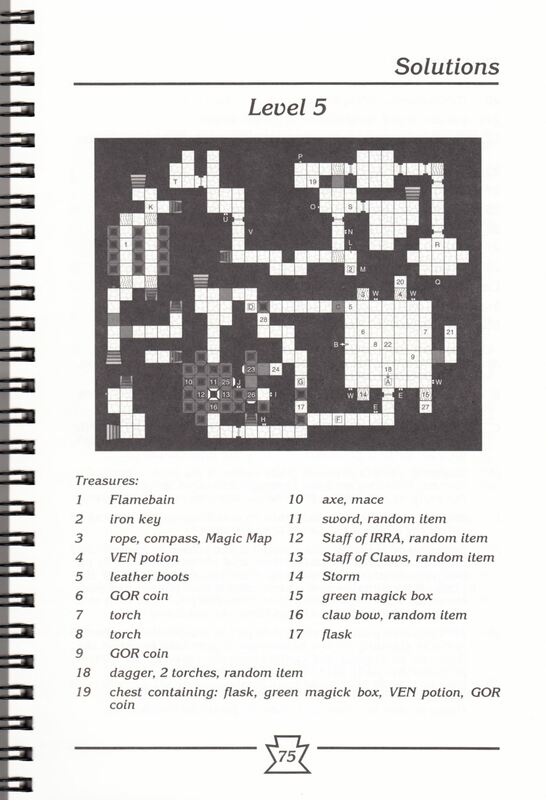 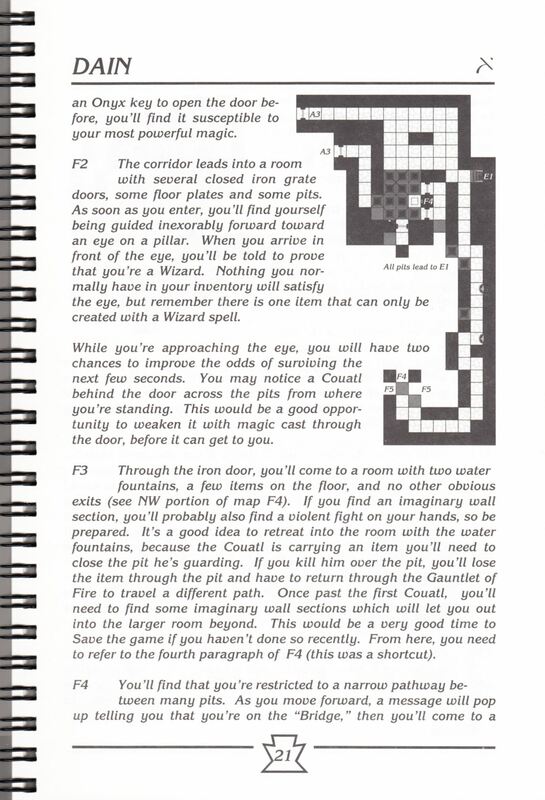 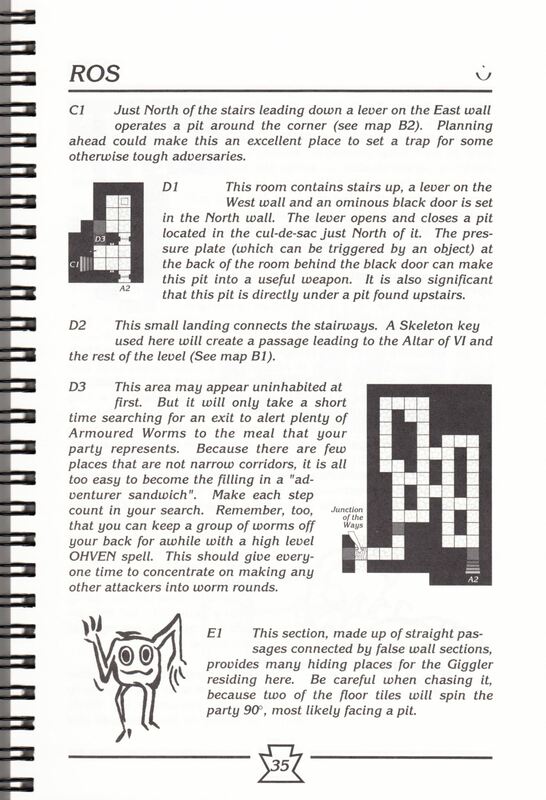 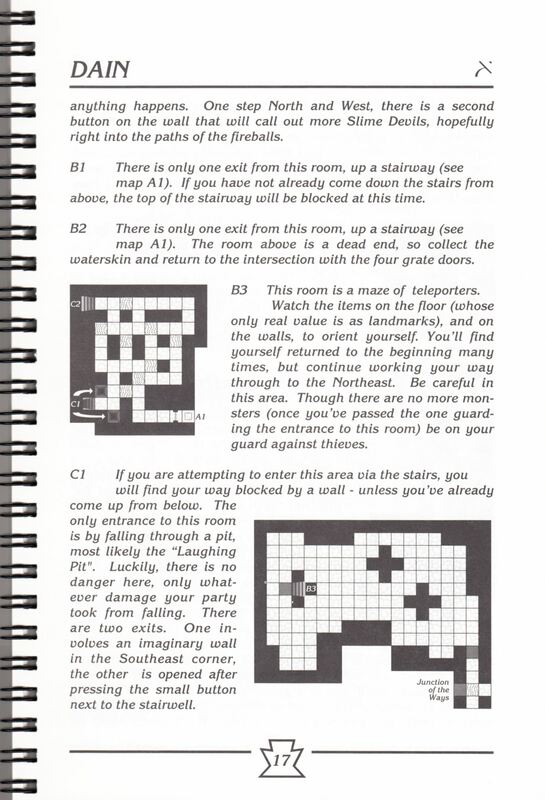 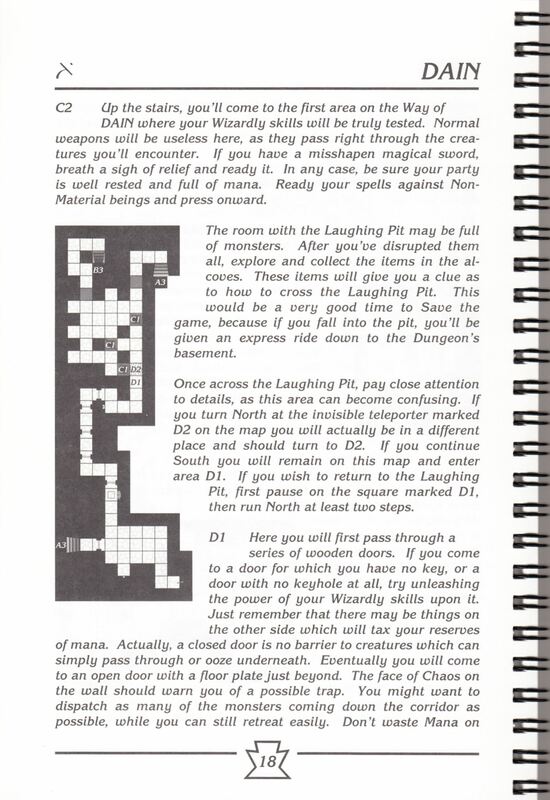 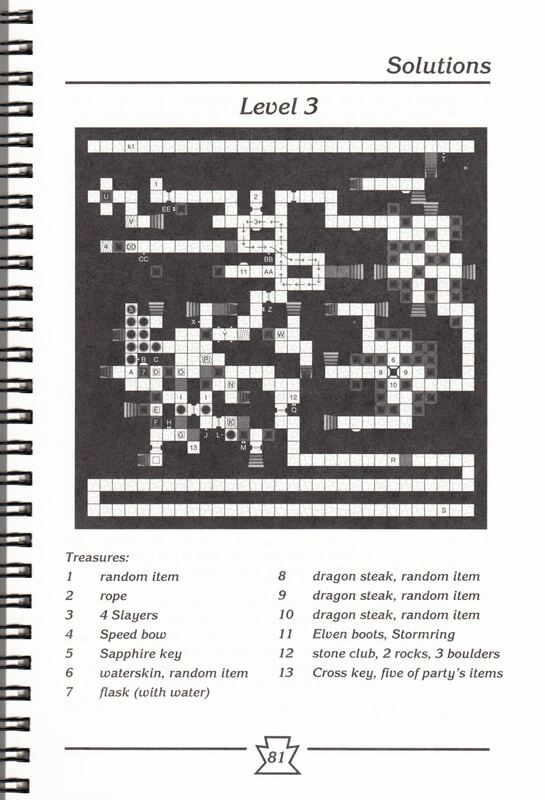 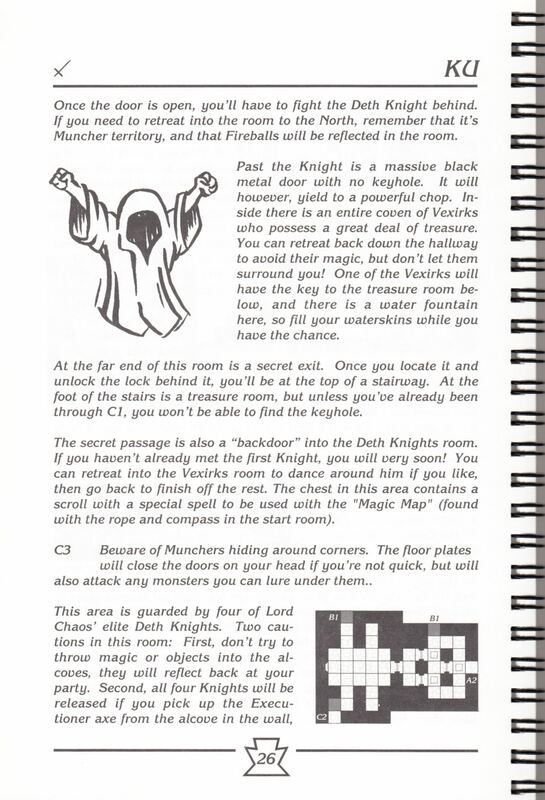 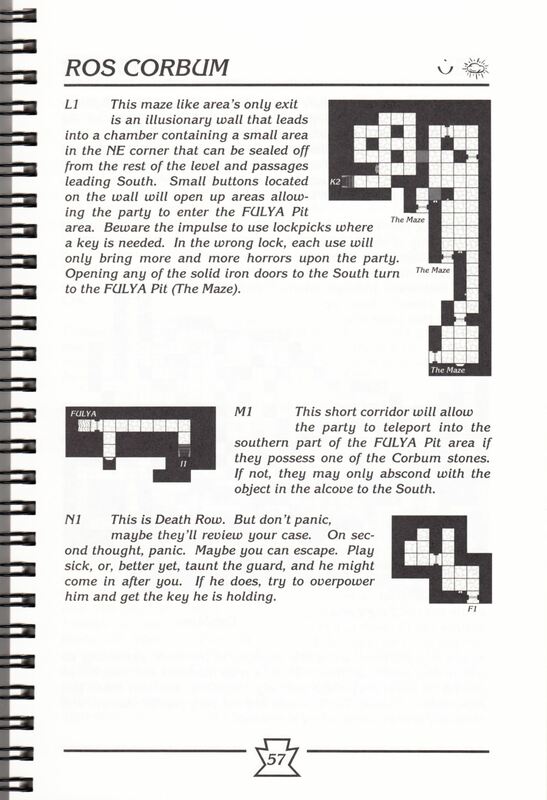 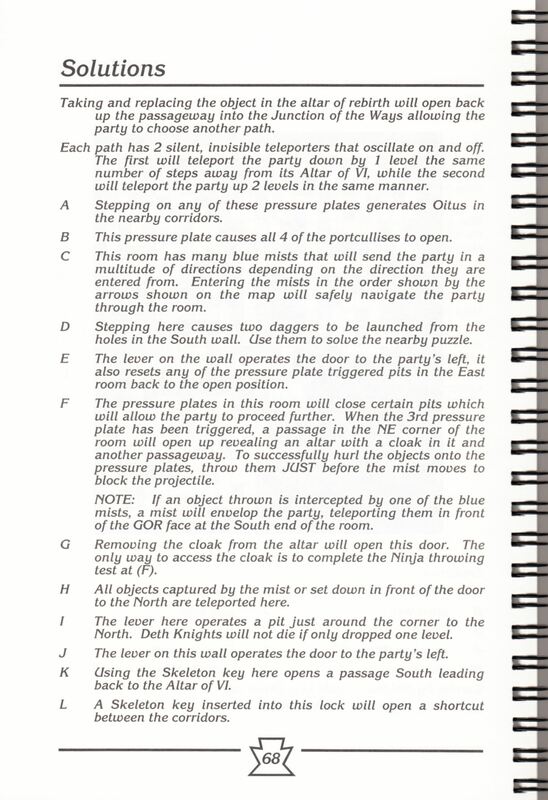 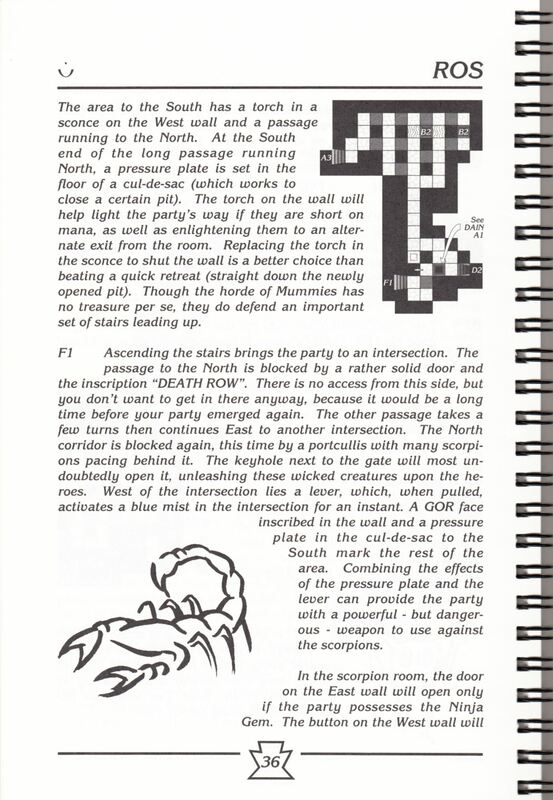 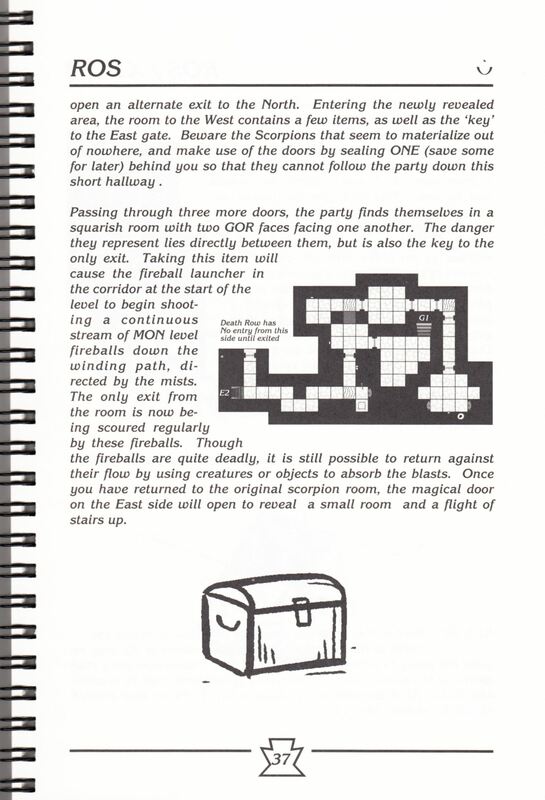 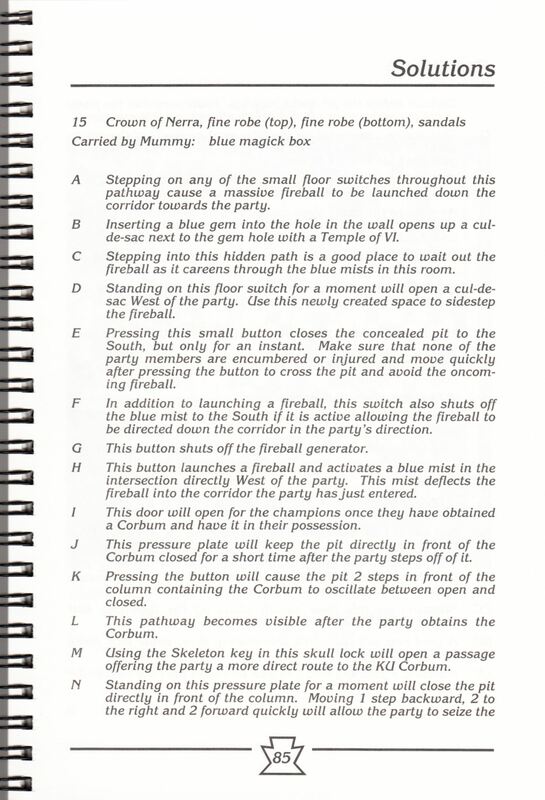 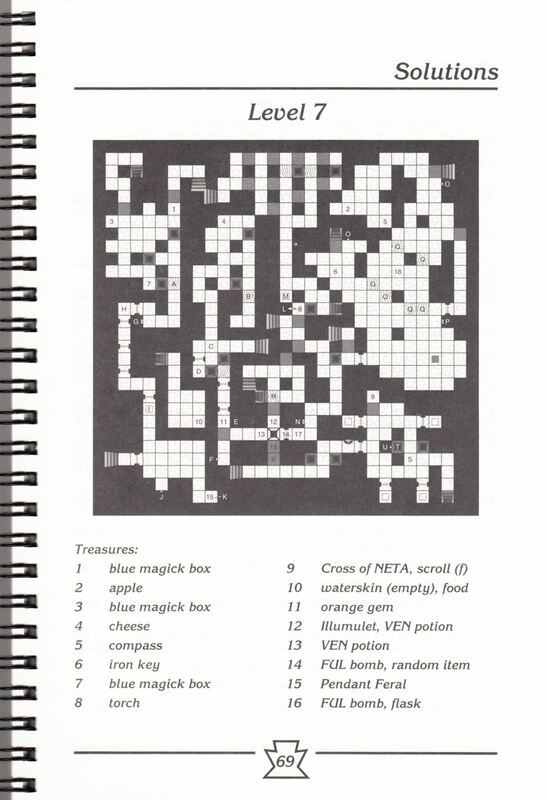 Next there are sections on pits (and how to get out of them - or not, as the case may be), compasses and two tables, one of magic spells and the second showing which monsters can be found in the dungeon, what levels they appear on, whether they use poison and whether they are found individually or in groups. 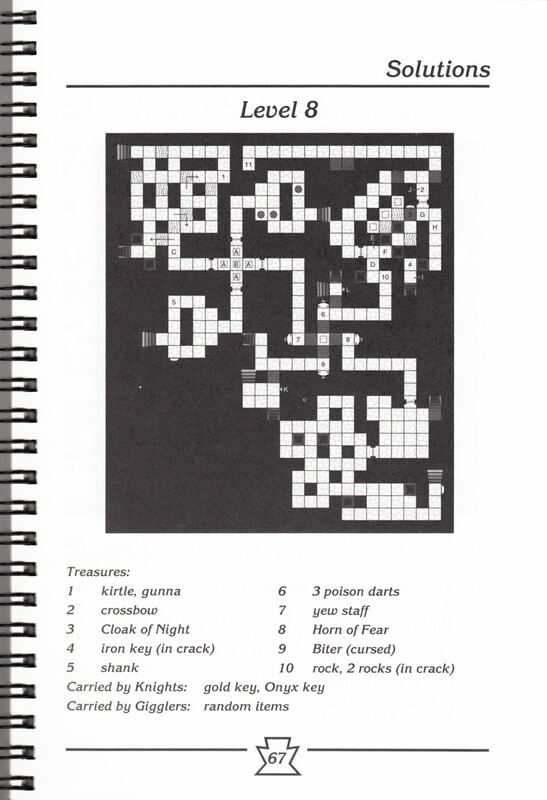 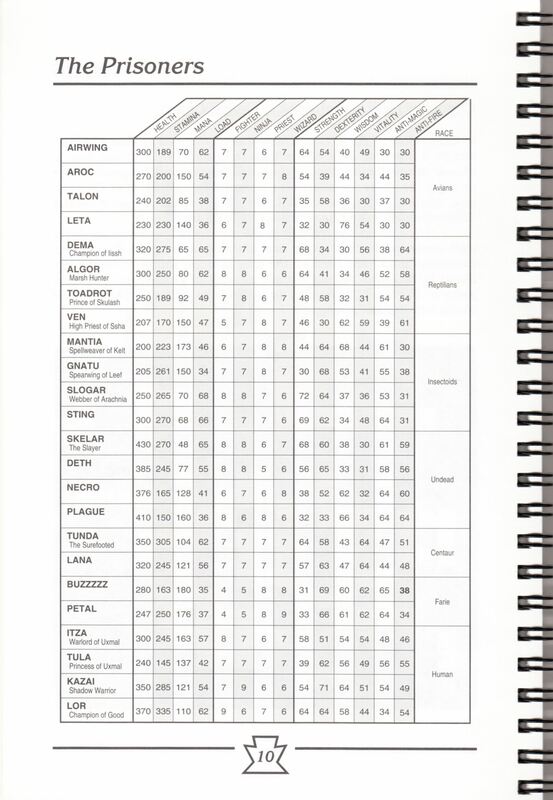 A map of the Prison section shows where all 24 champions are to be found and yet another table lists them and their statistics. 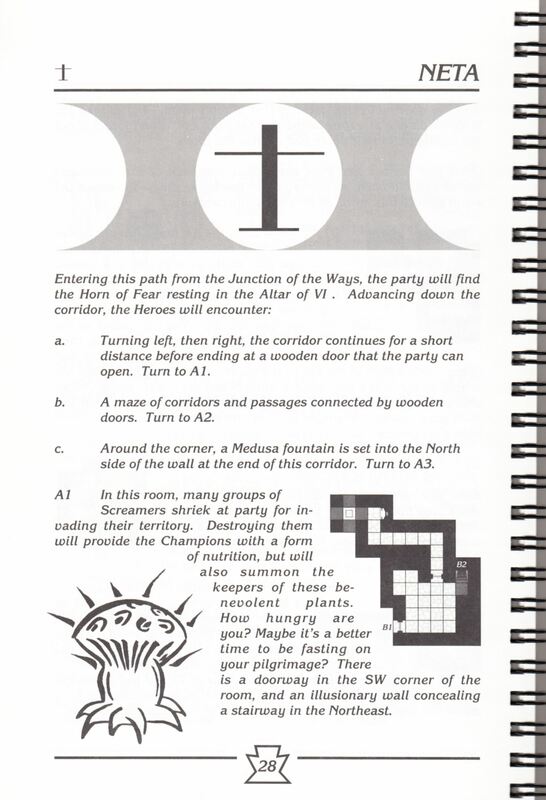 We're almost ready to start the game and still only on page 10! 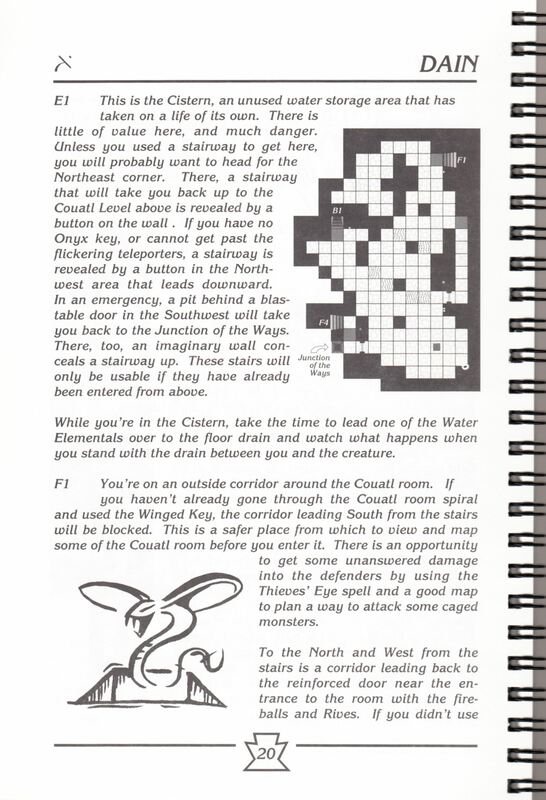 The starting section with its initial worm attack and the area known as Supplies for the Quick which leads onto the Junction of the Ways takes up the next two pages. 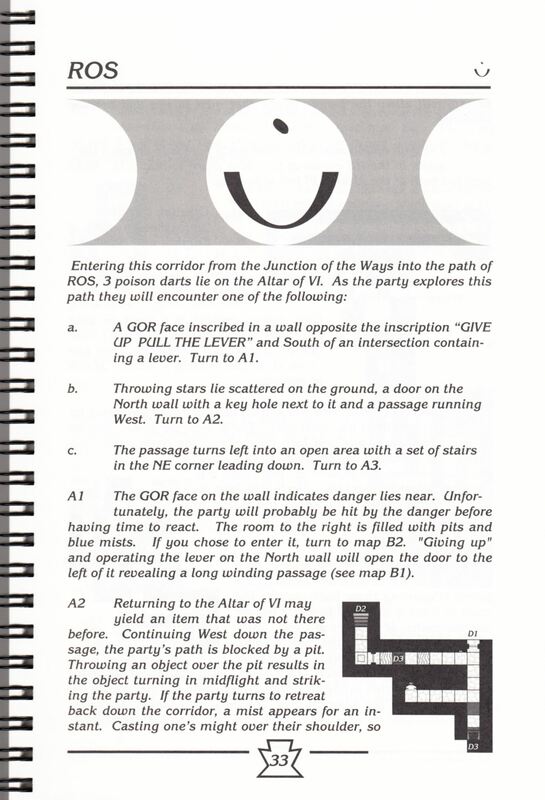 From the Junction of the Ways, the player must decide which of the four routes (Dain, Ros, Ku or Neta) to take. 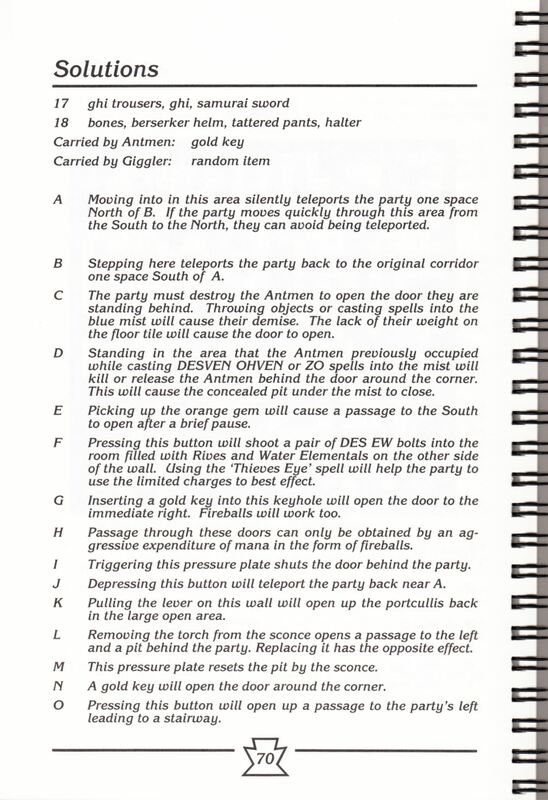 Each Way is described in order starting with Dain, the Way of the Wizard, and takes the form of a series of instructions identified by a letter and number. 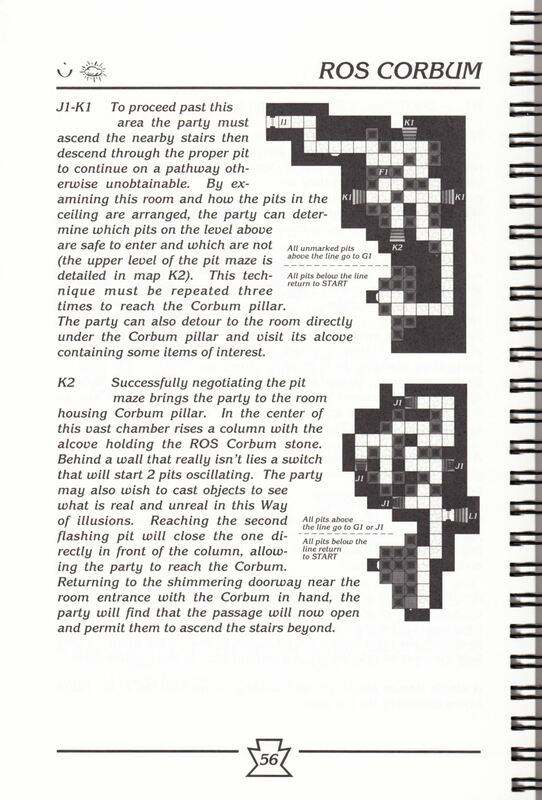 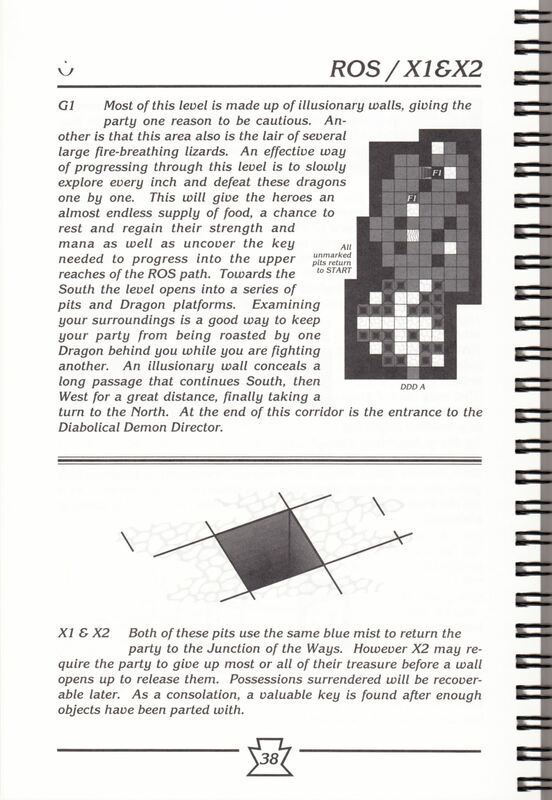 On completing a small section within each Way, each of which has its own small map, you'll be directed to another section eg D2, and can then find that area and continue reading. 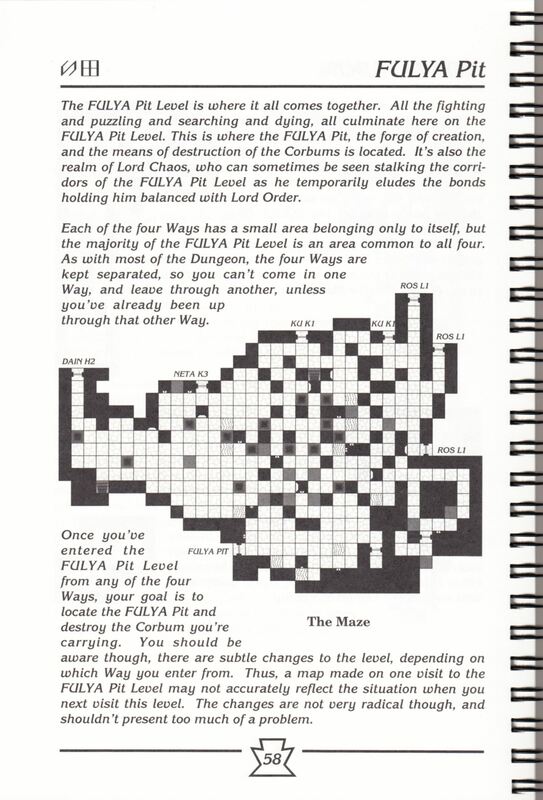 Each of these sections will give quite a bit of information about the various obstacles and problems that will crop up and hints for solving them. 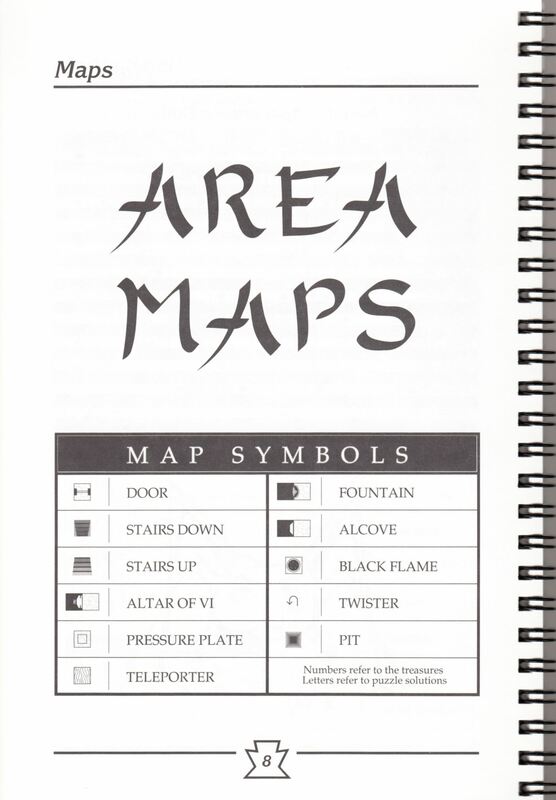 The maps also have the letters and numbers marked on them so you can find your way about by using the text or the maps or both. 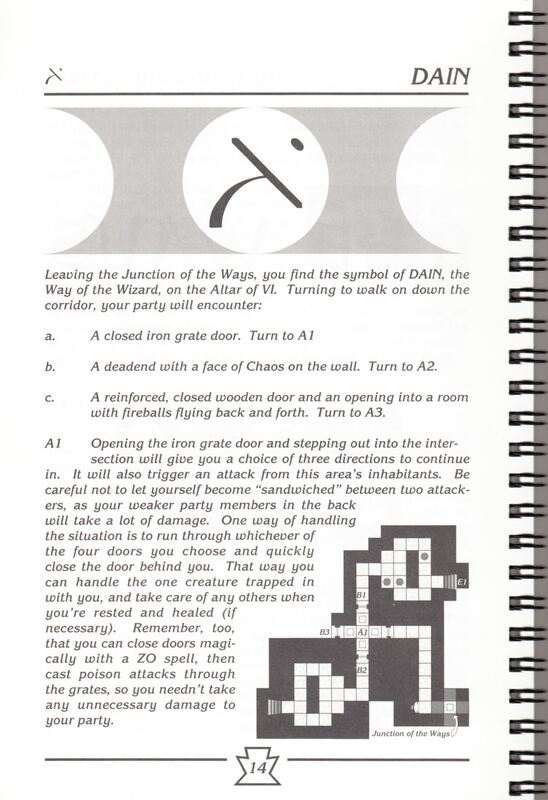 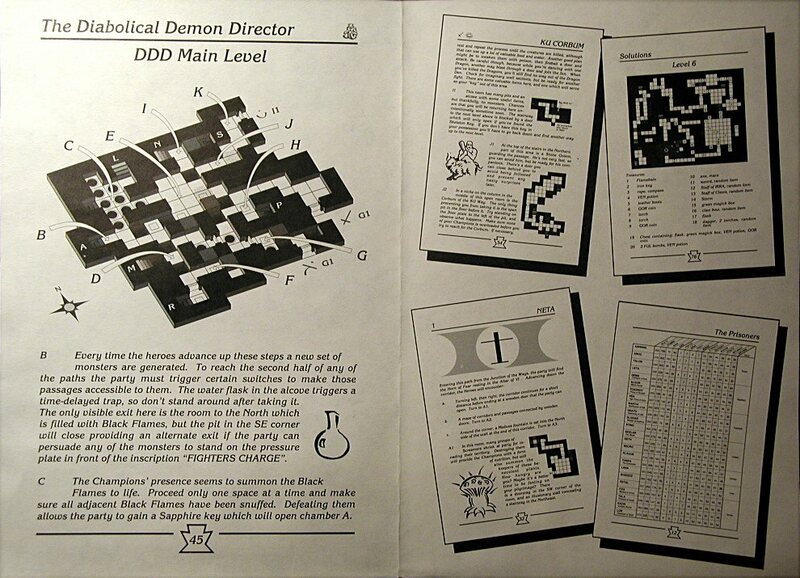 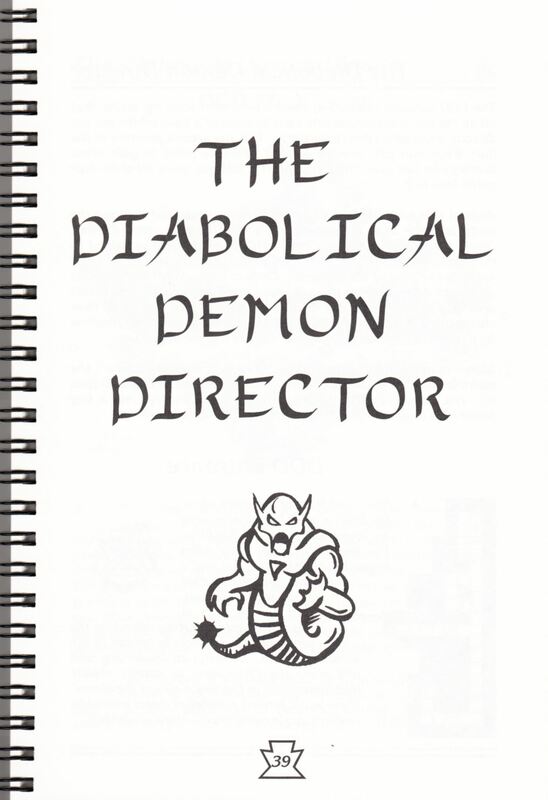 The four Ways meet up again at the Diabolical Demon Director (the DDD) and the main level of this is drawn in a slightly different way, as an isometric map. 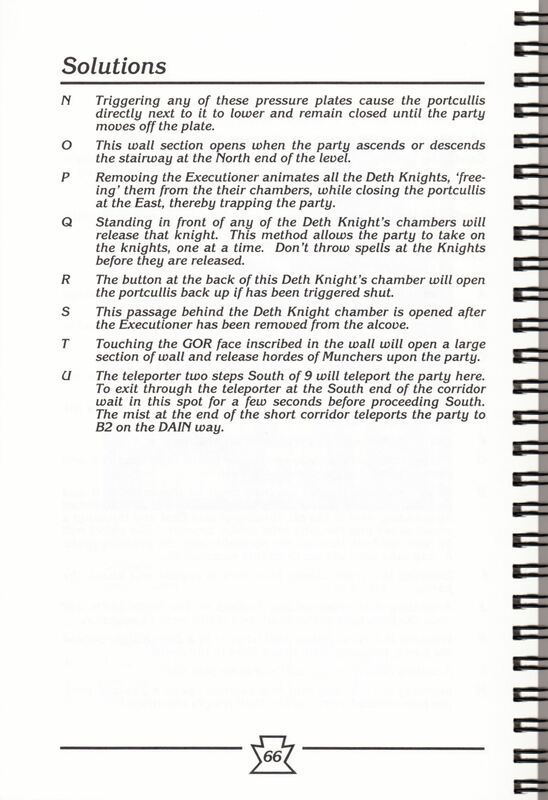 This is very effective as it gives some impression of the thickness of the walls and so forth. 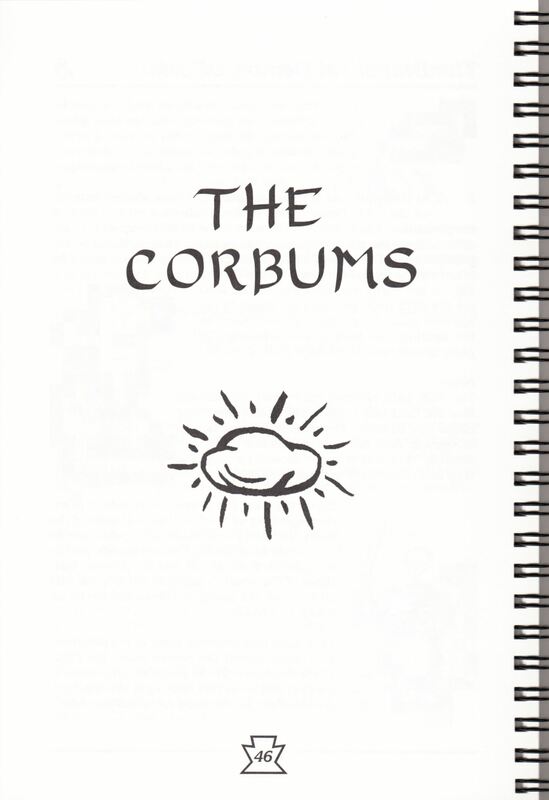 The next section of the book deals with the discovery of the four corbums, and the next three pages cover the Fulya Pit level. 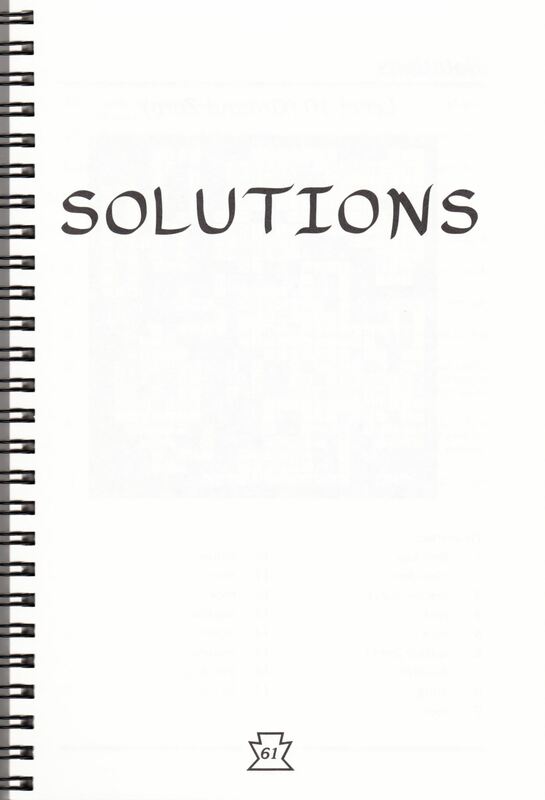 By now we're two-thirds of the way through the book so it's time to enter the solutions section. 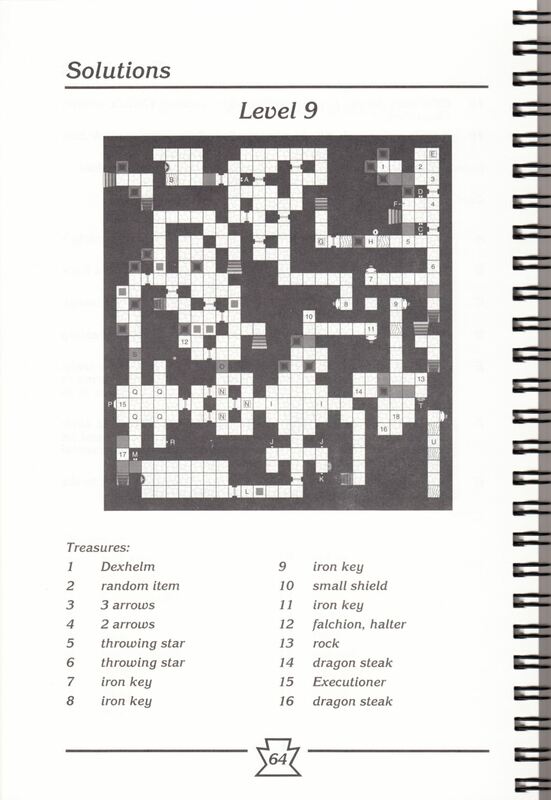 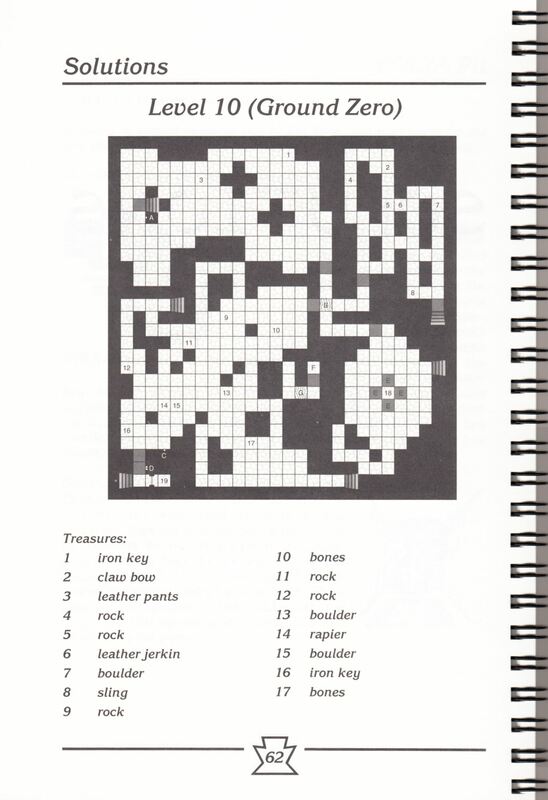 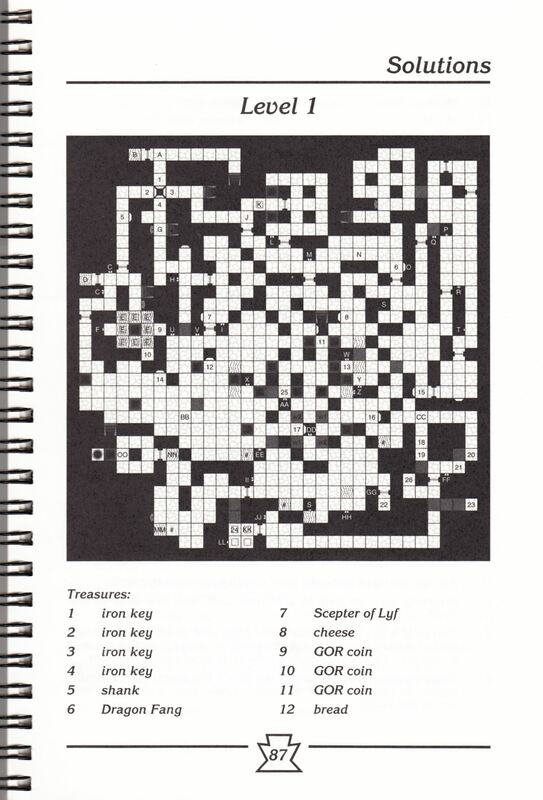 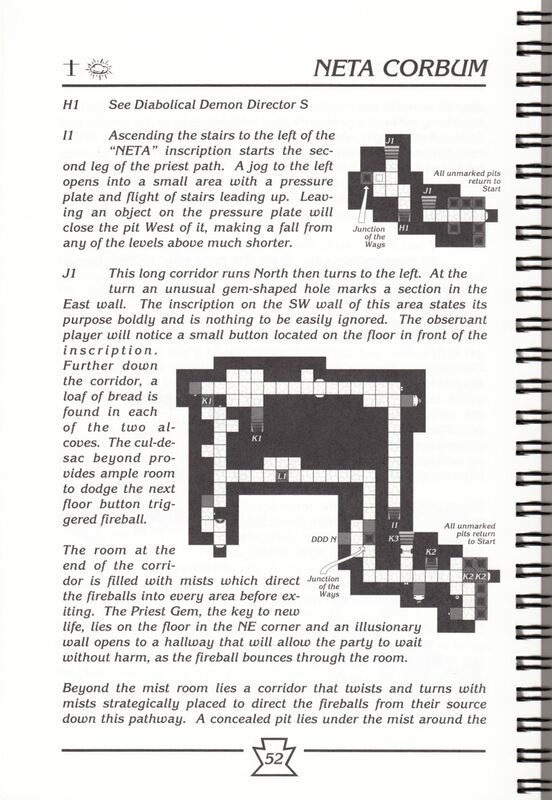 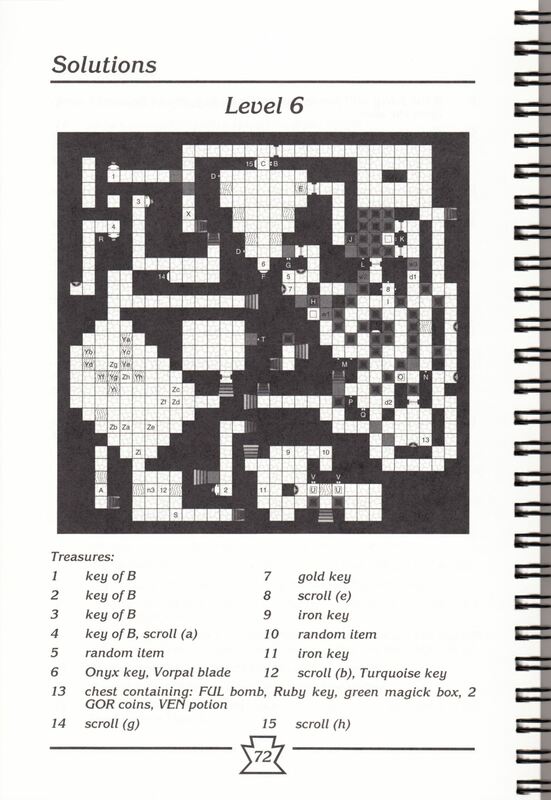 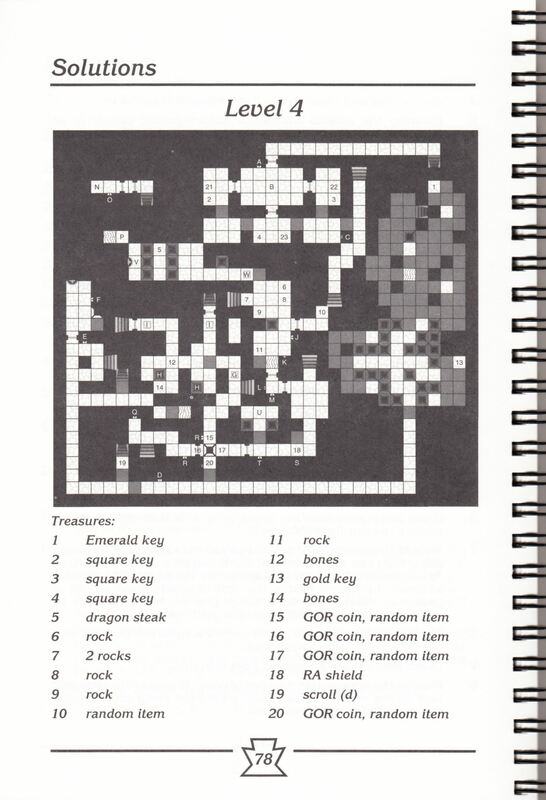 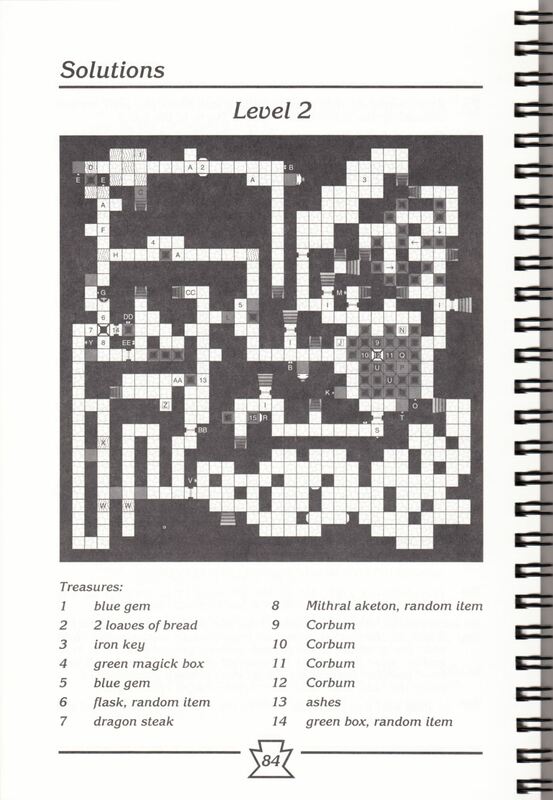 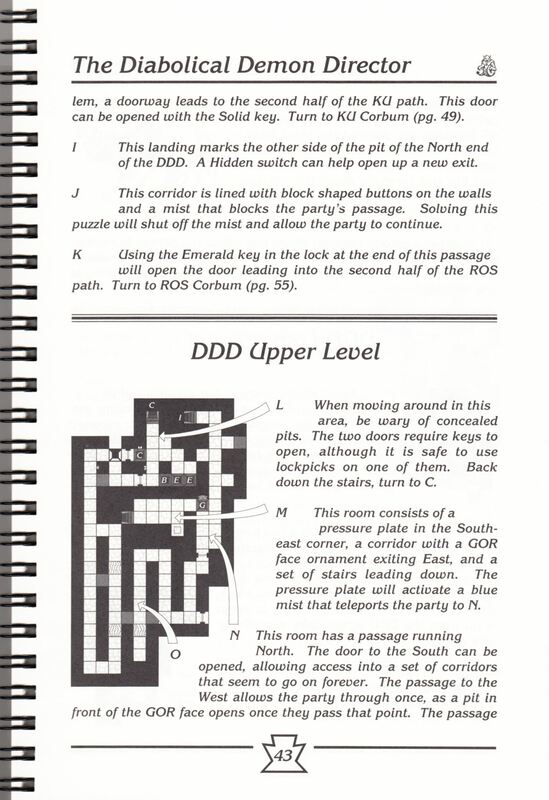 Each of the 10 levels is covered in turn, with a full map and a list of treasures and the major problems that will be encountered, all identified by letter or number and cross-referenced to the map. 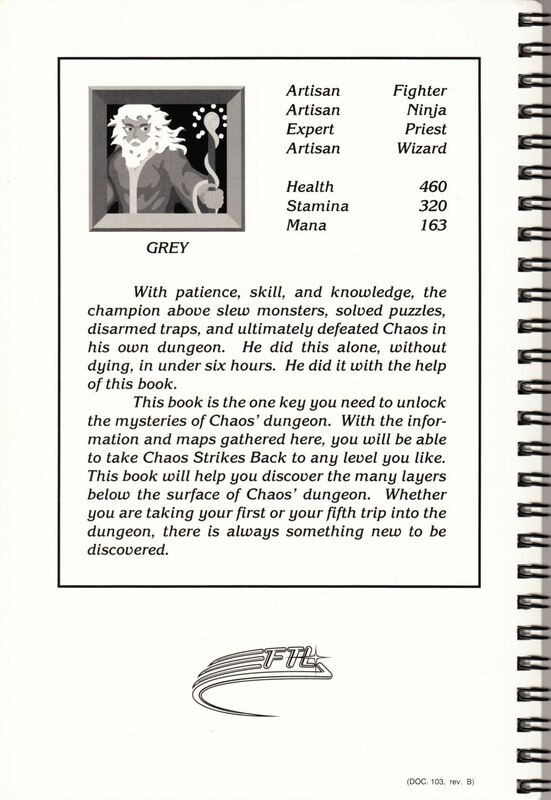 Considering how complicated the game is, it's surprising how much information the authors have managed to get into what is a relatively small book. 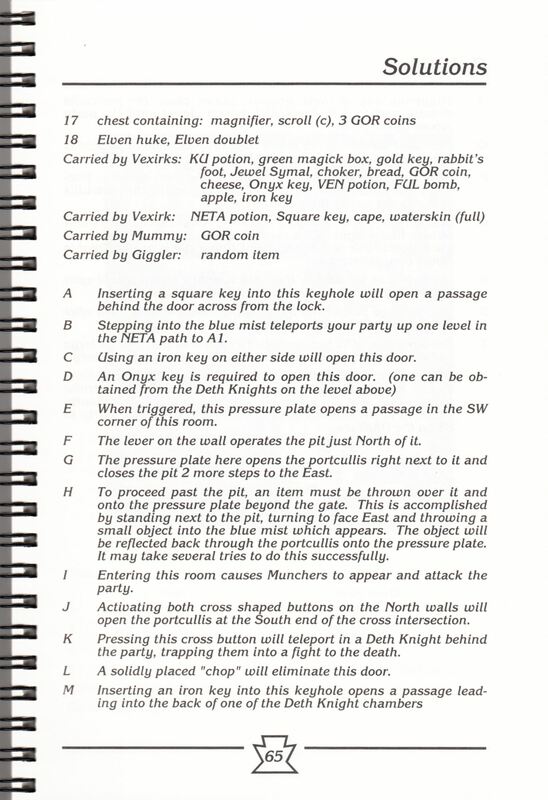 The explanations of the puzzles aren't especially verbose but still give plenty of detail so I wouldn't imagine that anyone would particularly need more information than is given .... then again, I haven't played the game in any great depth so it would be interesting to see how useful it would appear, in retrospect, to someone who had completed the game. 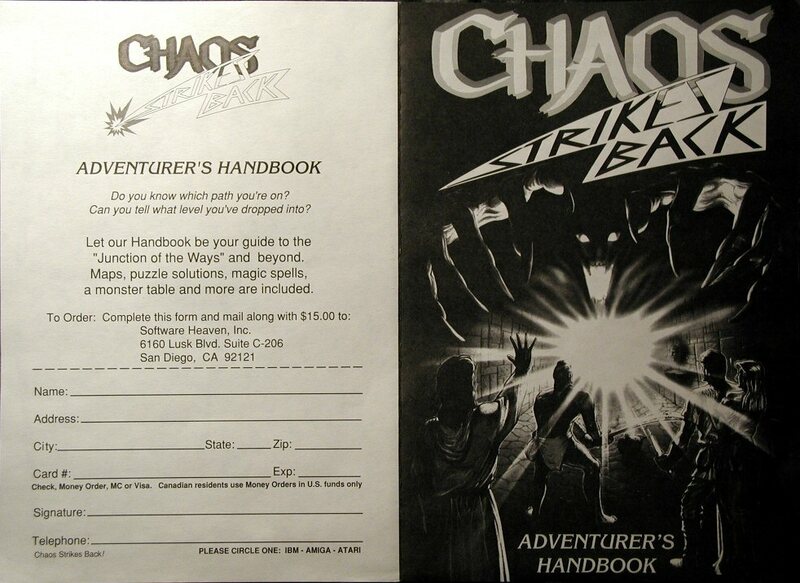 When I get the time to return to Chaos, I think I will find the book invaluable. 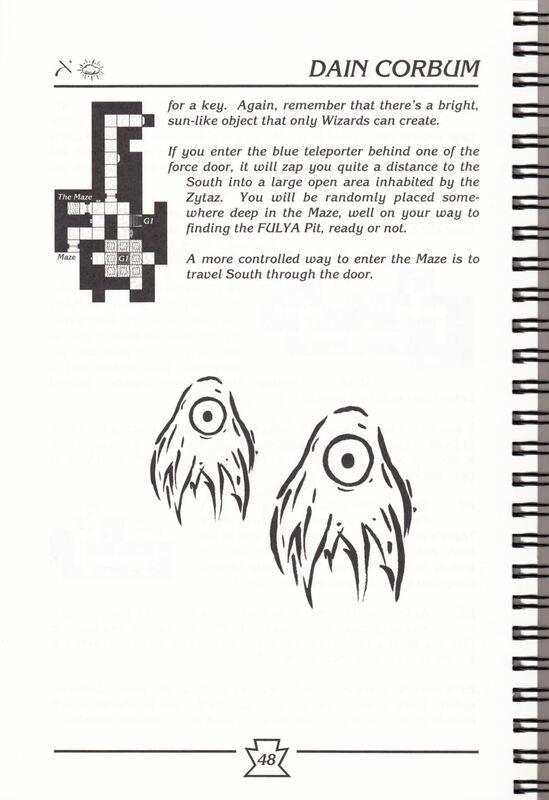 Until then, the way it is arranged should make it ideal for helping people over the phone when they're stuck in it because it looks pretty easy to identify any area of the game from a minimum amount of information.